Most of the time it’s nice to have a central theme. 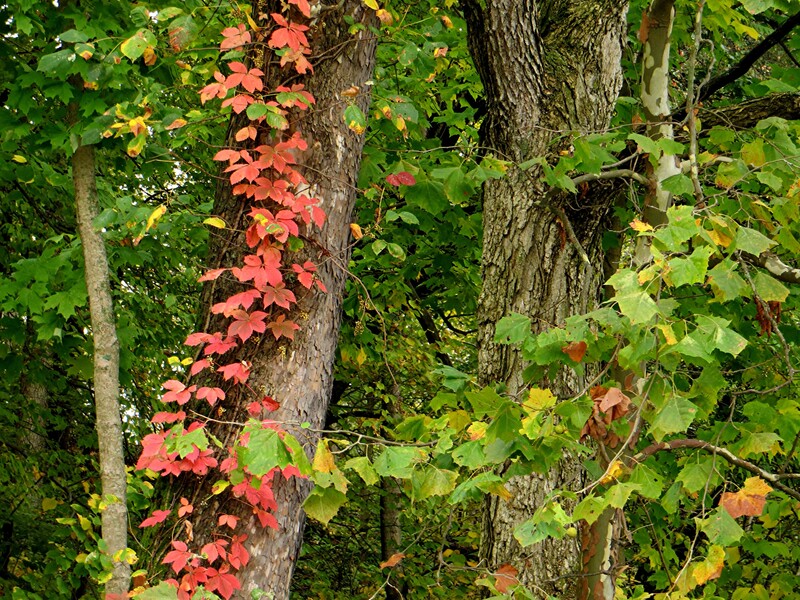 However, for the most part, this post just meanders through early autumn and celebrates the time of year in some of our central Ohio parks. I continue to enjoy shooting a portion of my photos with a Sony A7, adapter, and legacy Canon FD lenses. It’s nice to have so much control over depth of field. 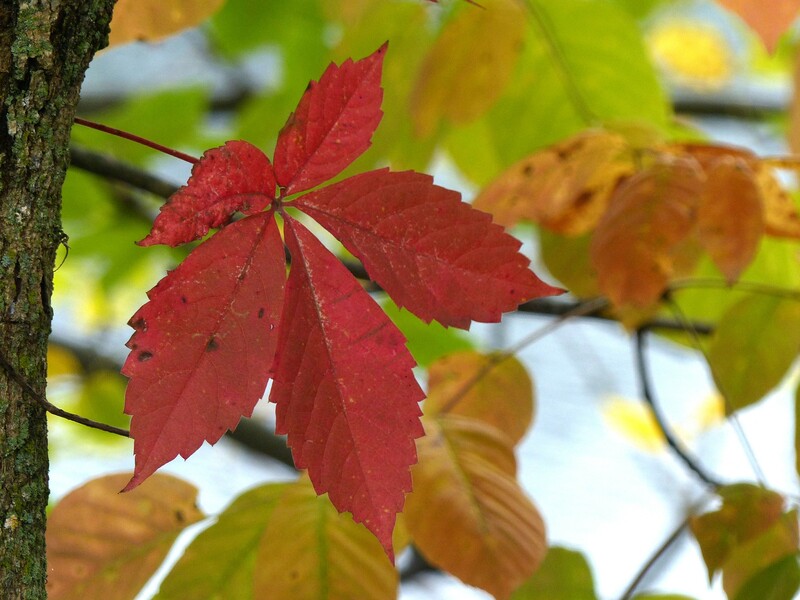 My wife is ever on the lookout for things small, be it insects or details that charm in the fall foliage. The Big Darby, Prairie Oaks Metro Park. 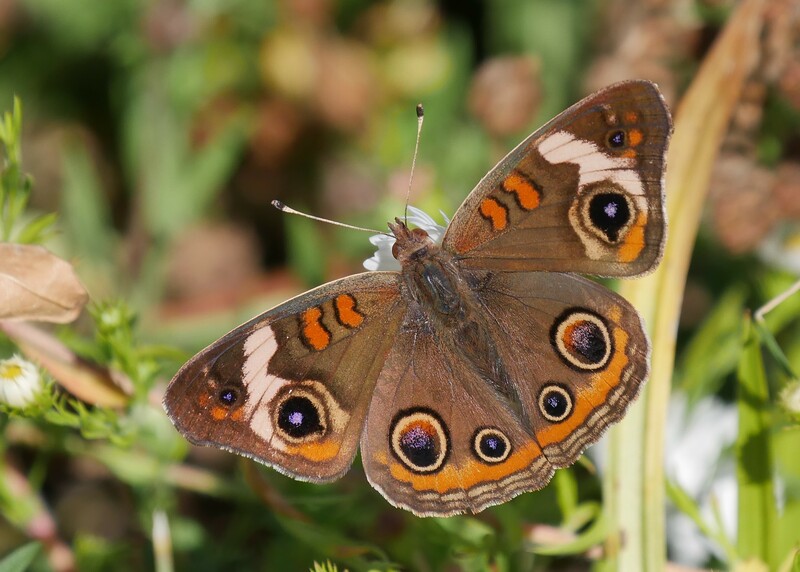 Monarchs continue to work their way south while a few late summer buckeyes, having made their way to central Ohio, enchant. 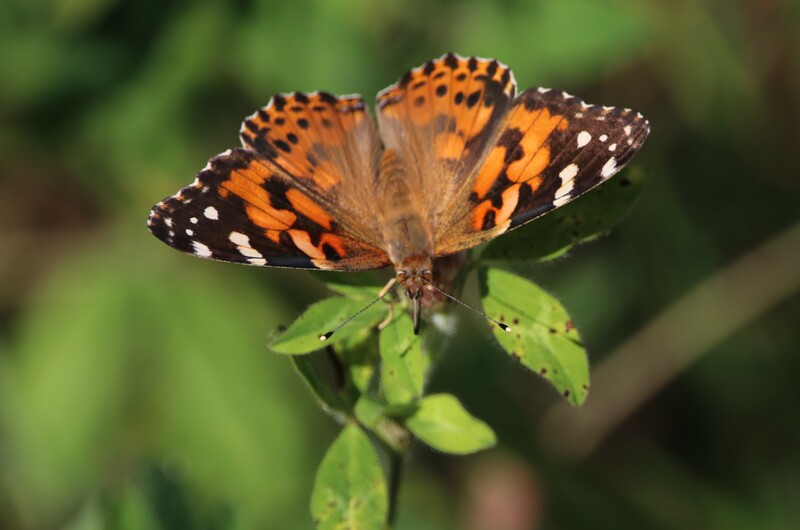 Painted Ladies and Viceroys also continue to be seen. 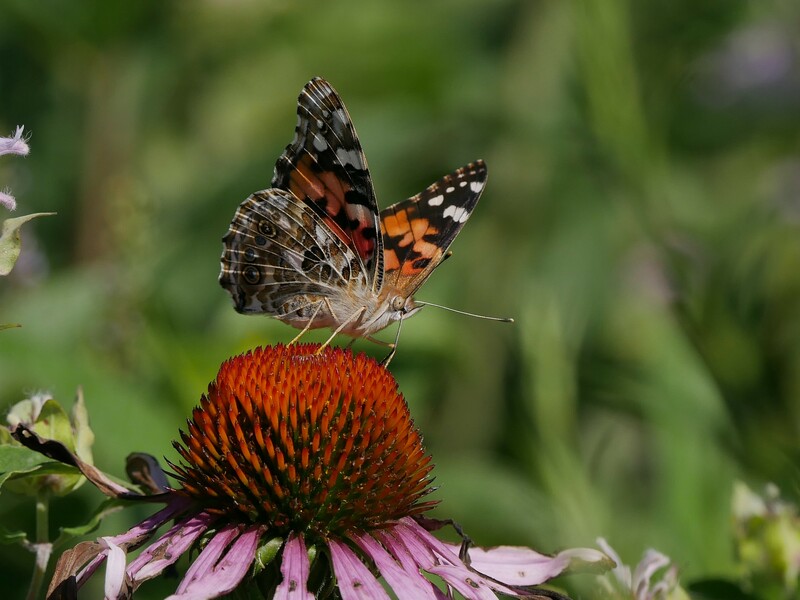 Are Painted Ladies more beautiful with wings closed or open? 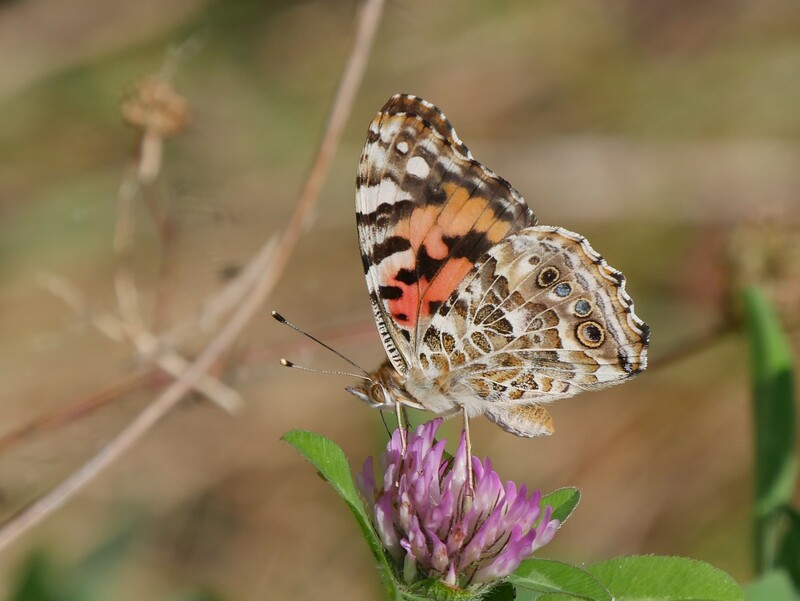 Painted Lady, Prairie Oaks Metro Park. 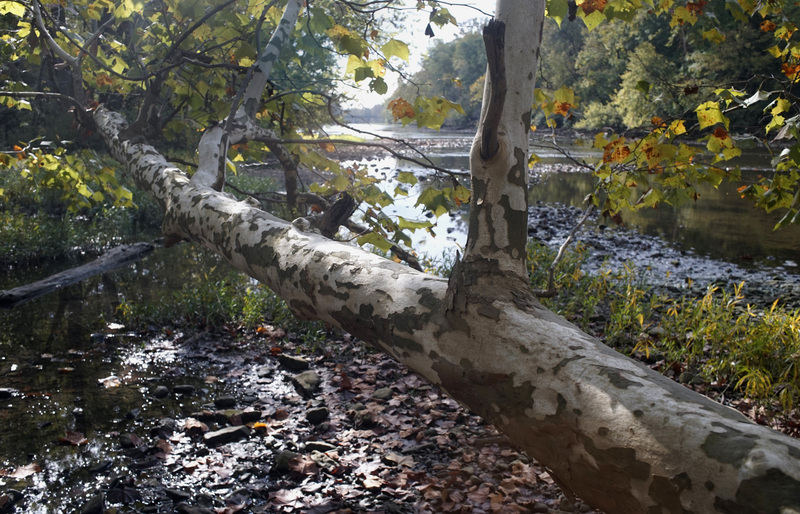 Leaves continue to grace a long fallen Sycamore along the Scioto River below Griggs Dam. 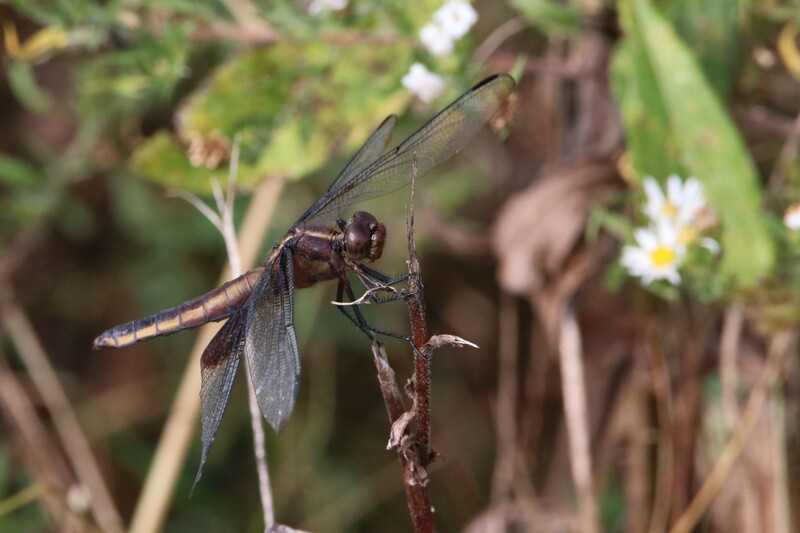 There still may be time before the first hard frost results in an abrupt end to most of the current insect activity. Katydids and crickets that so willingly provide the late summer soundtrack for our outdoor adventures will fall silent. The purpose of their time here will emerge next spring and take up the charge as the dance of death and life continues. Meanwhile as autumn moves on we continue to enjoy their life. 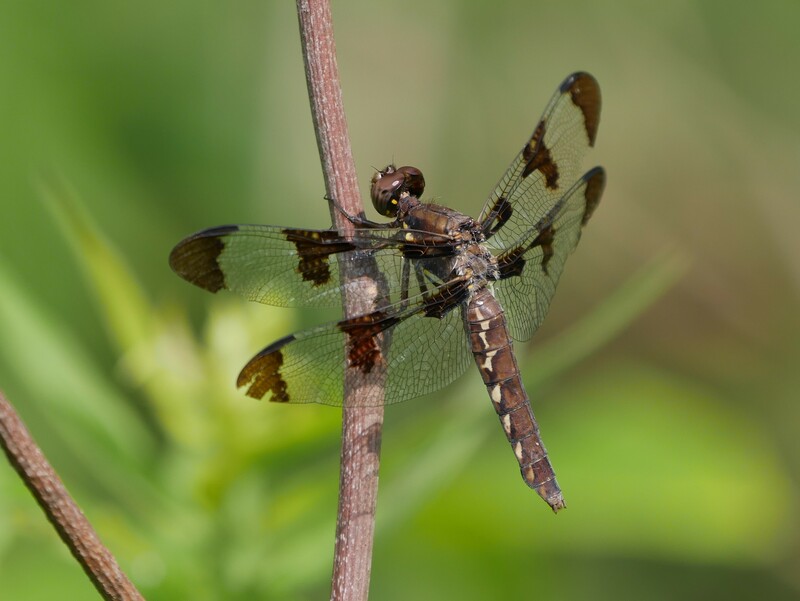 Widow Skimmer, Prairie Oaks Metro Park. 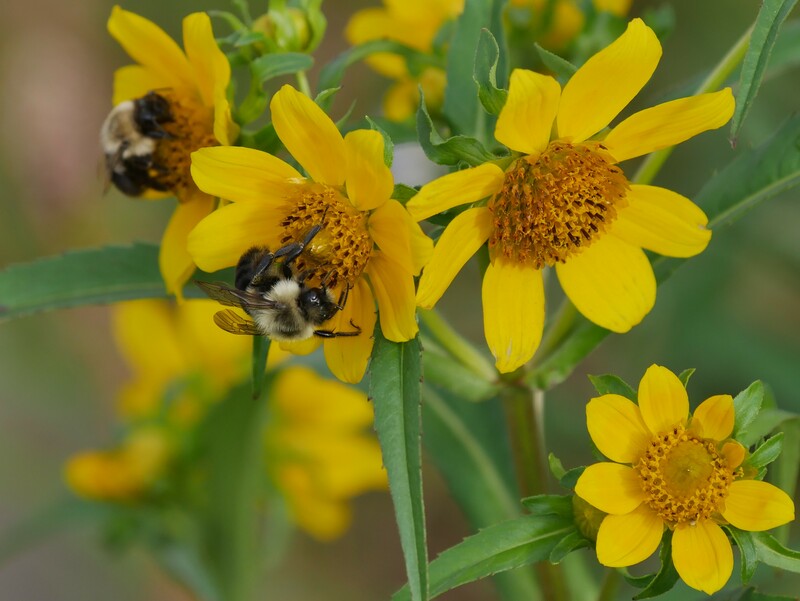 Bees on Nodding Bur-marigold, Griggs Reservoir Park, (Donna). 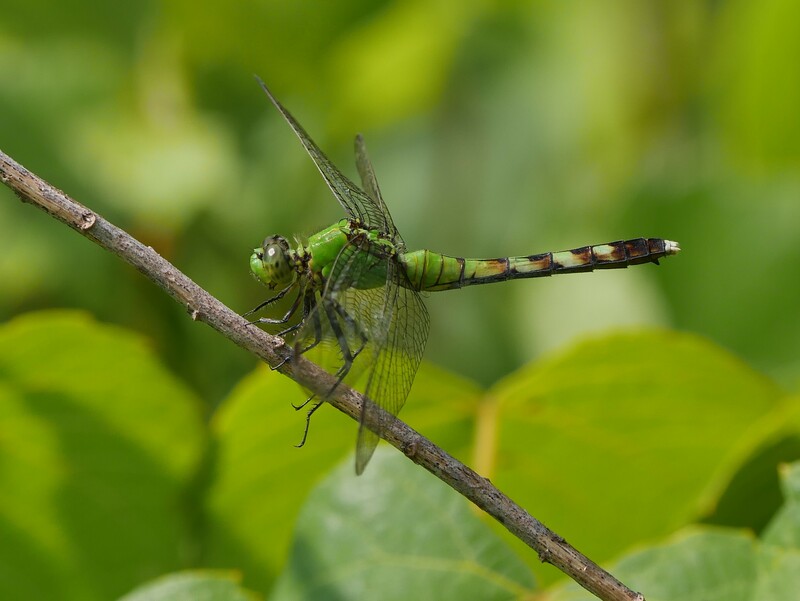 Male Eastern Pondhawk, Prairie Oaks Metro Park, (Donna). 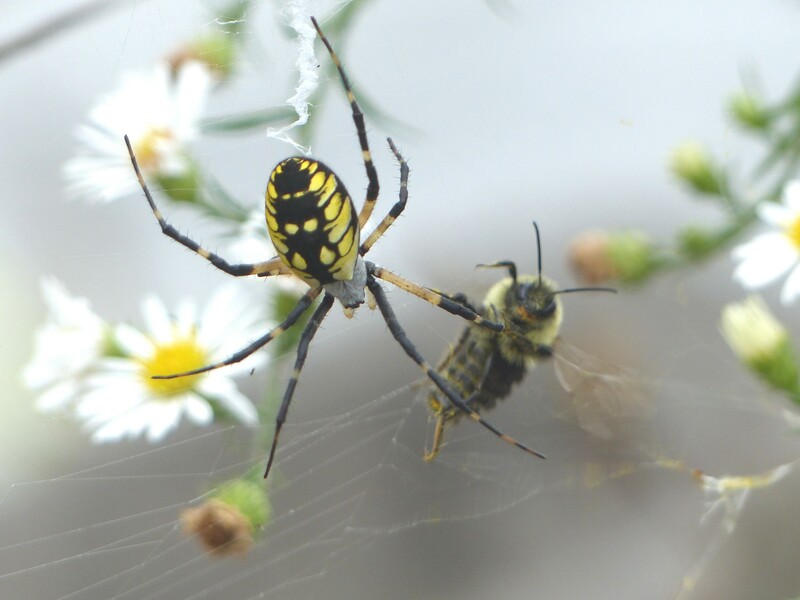 Black and Yellow Garden Spider, the bee managed to allude the spiders web, Griggs Reservoir Park, (Donna). 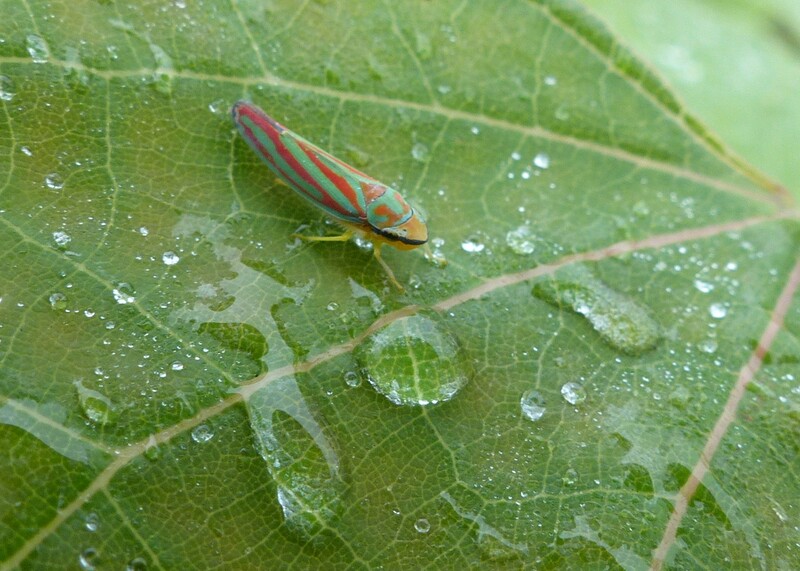 Scarlet and Green Leaf Hopper, Griggs Reservoir Park, (Donna). 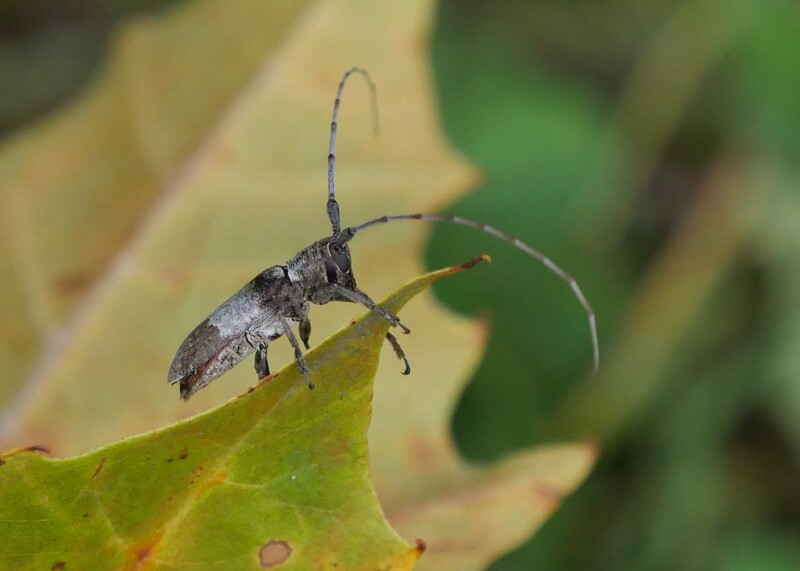 Long Horned Beetle, not sure which one, Griggs reservoir park, (Donna). 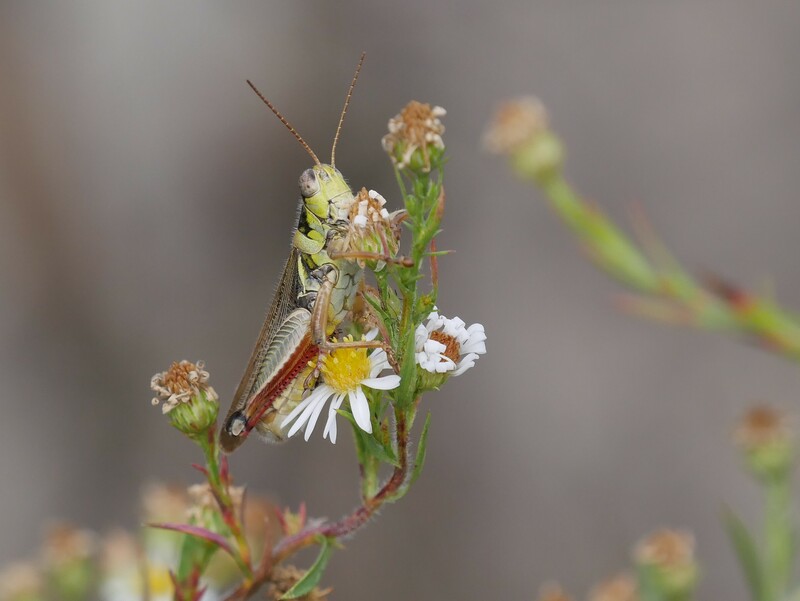 Grasshopper, Griggs Reservoir Park, (Donna). 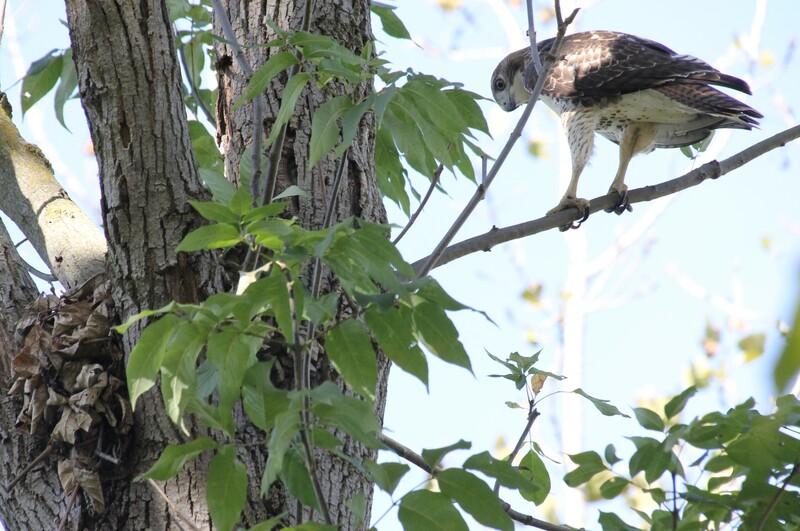 Recently we were fascinated by an immature Red-tailed Hawk that posed to have it’s picture taken and then decided to fly into a nearby tree in an attempt to extract a meal from a squirrels nest. 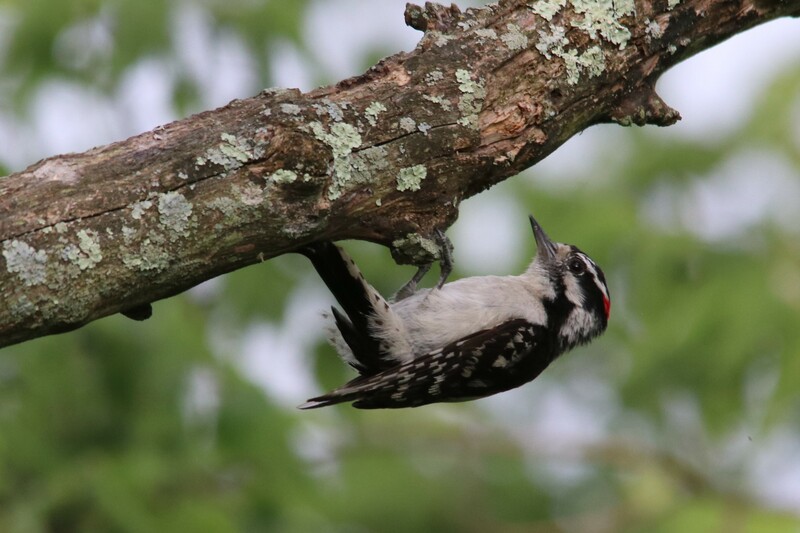 It did succeed in arousing the occupants but standing on top of the nest it was no match for them as they circled and sprang from branch to branch until they were out of harms way. 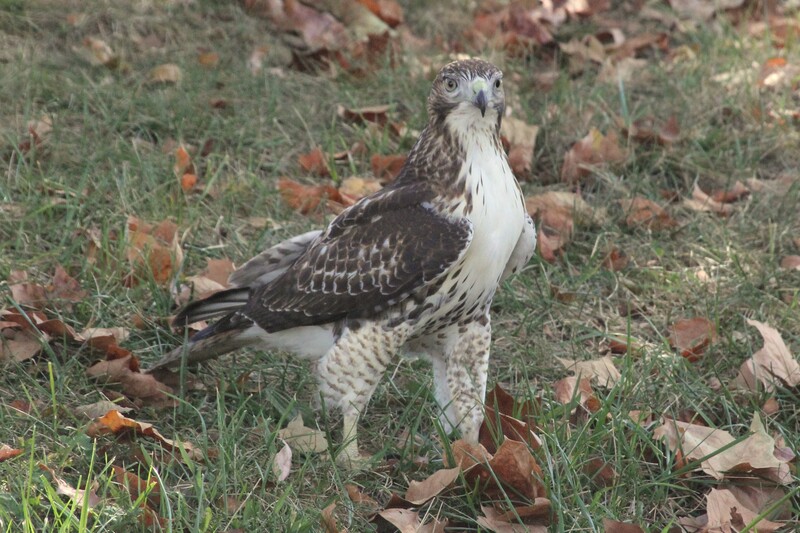 Red-tailed Hawk, Griggs Reservoir Park. Come on out of there, I just went to play, honest! 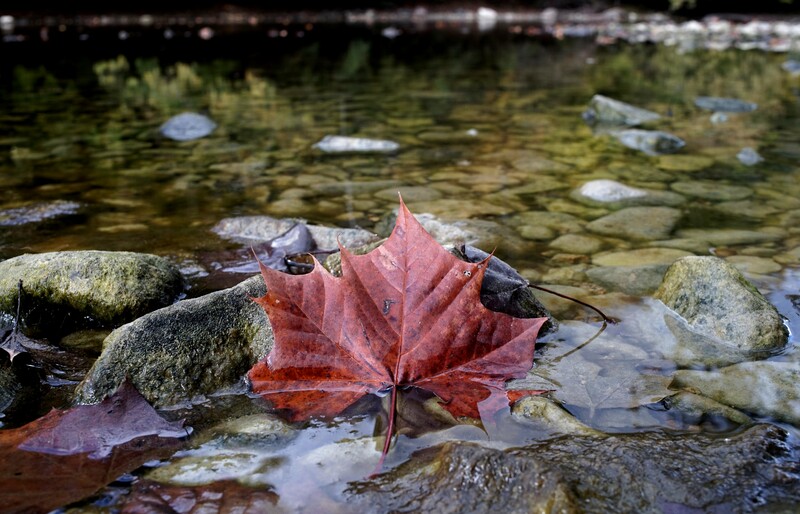 A hint of autumn, Griggs Reservoir. 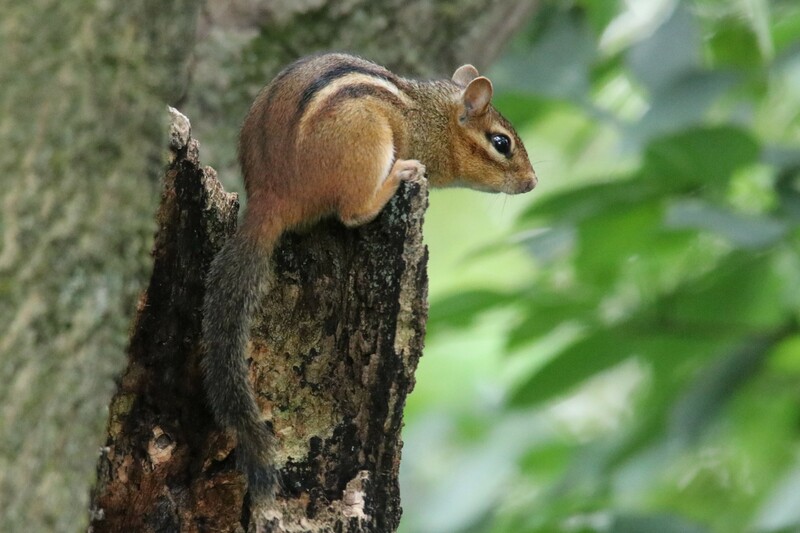 With the days now much shorter, other creatures seem to sense that colder weather is just around the corner as they enjoy the morning sun or in the case of the squirrels and chipmunks busy themselves collecting stores for winter. Painted Turtle, Prairie Oaks Metro Park. 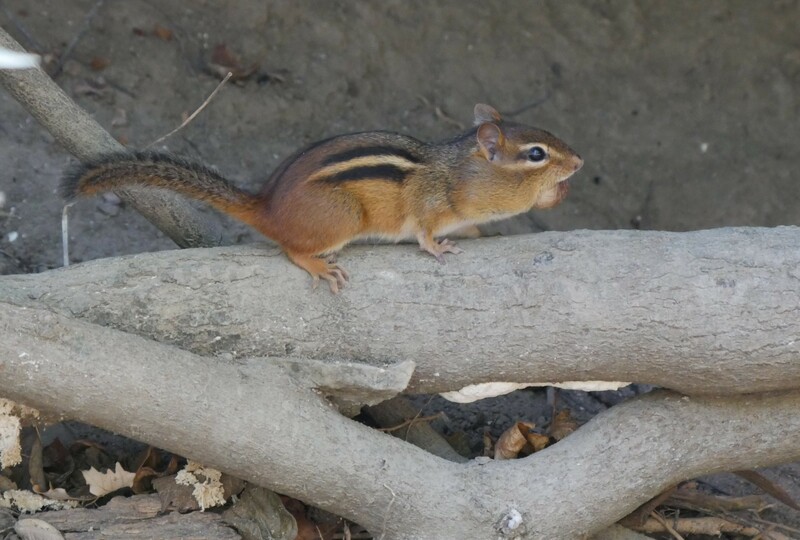 Chipmunk with acorn, Griggs reservoir Park, (Donna). 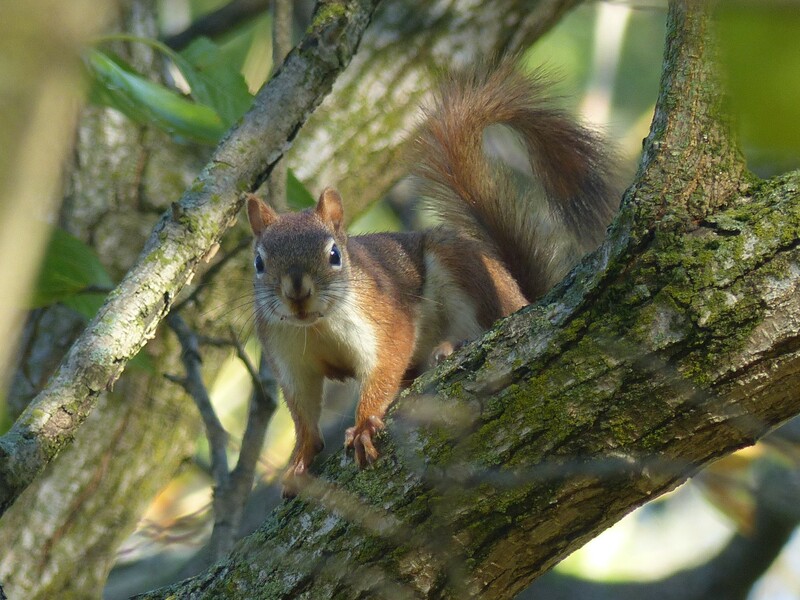 Red Squirrel, Griggs Reservoir Park, (Donna). 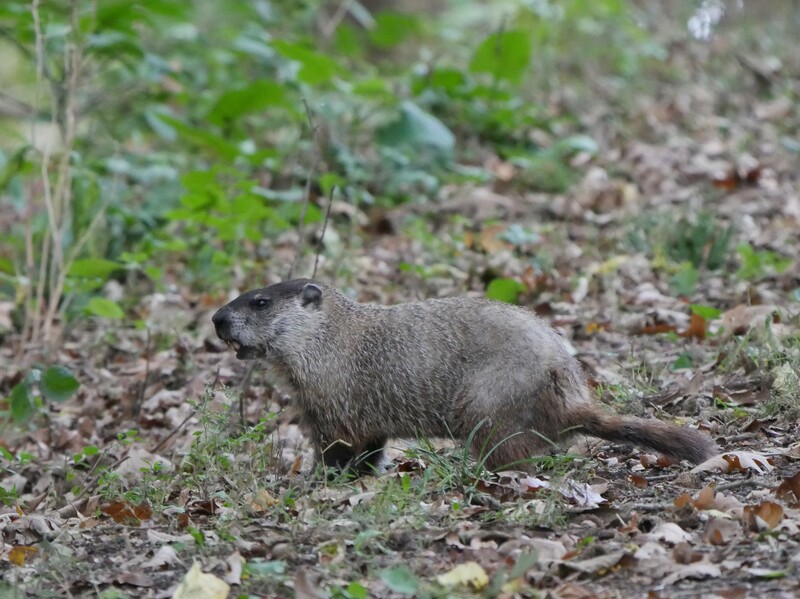 Groundhog, Griggs Reservoir Park, (Donna). 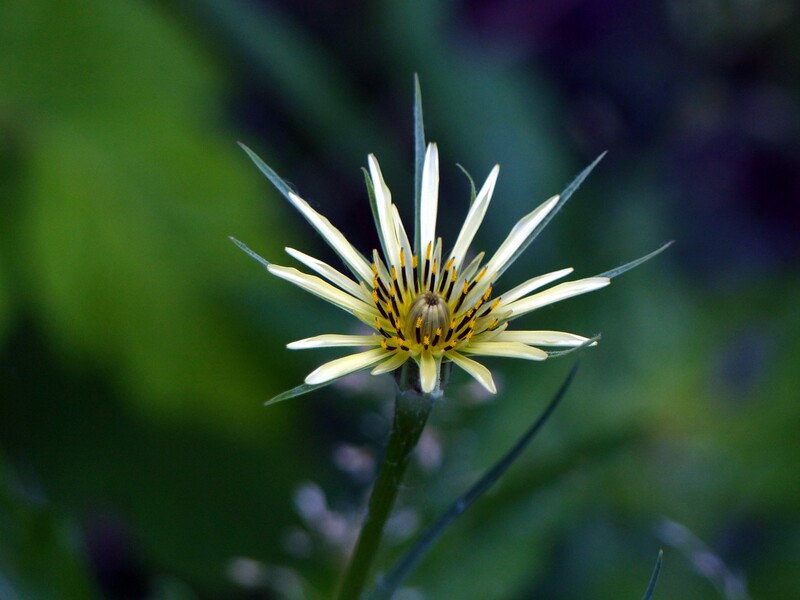 Asters and other late summer flowers now compete with leaves for the seasons beauty. 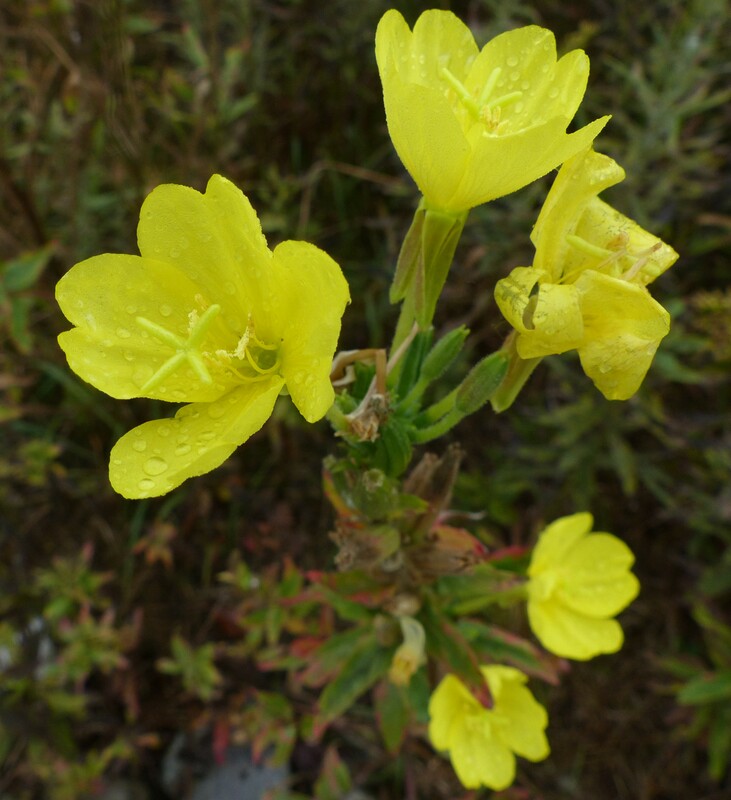 Evening Primrose, Griggs Reservoir Park, (Donna). 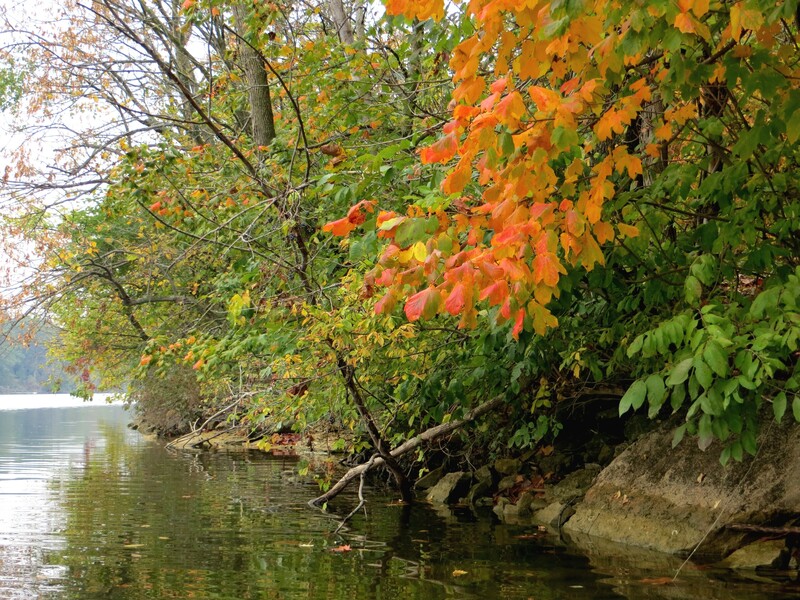 The Scioto River pays tribute to autumn. 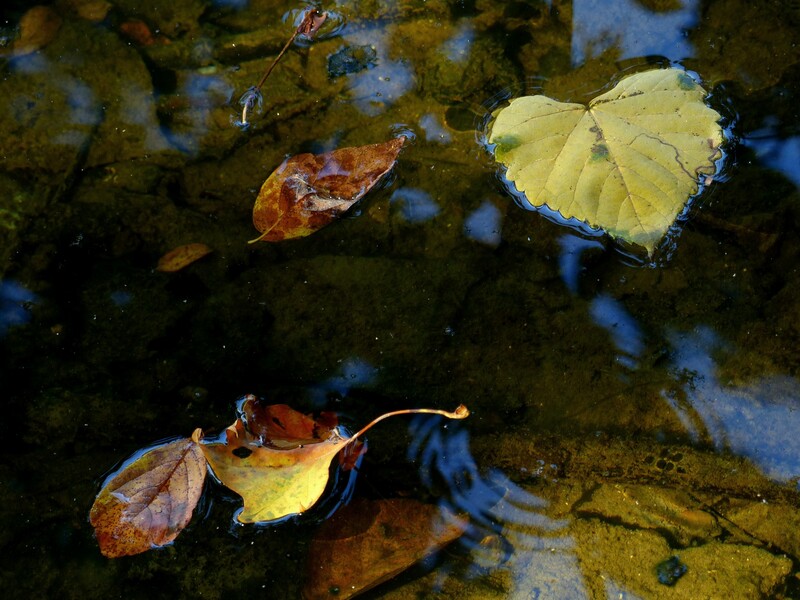 The river peeks through windblown leaves as they struggle to hang on, Griggs Reservoir Park. 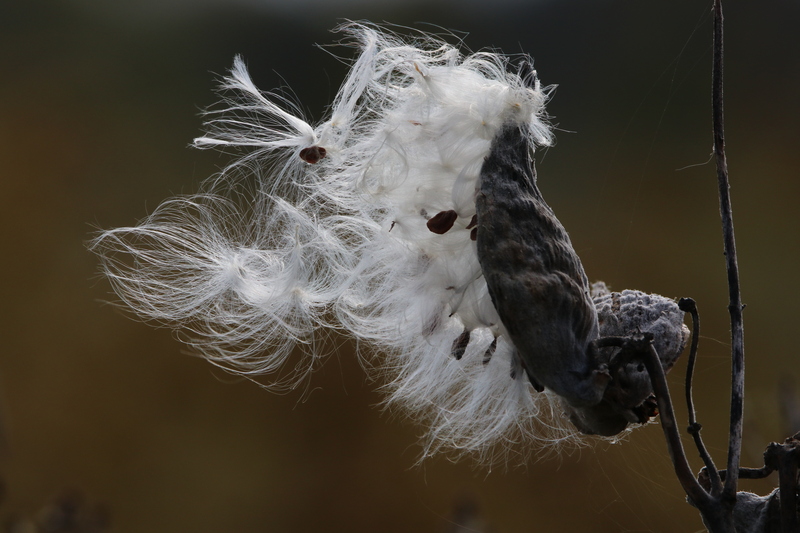 In the autumn breeze milkweed seeds prepare to take flight, Prairie Oaks Metro Park. 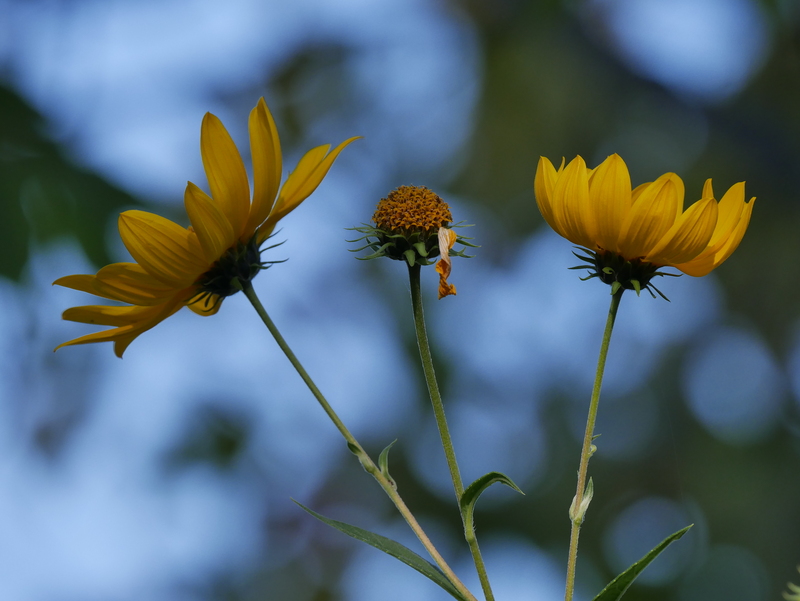 Sunflowers, Griggs Reservoir Park, (Donna). 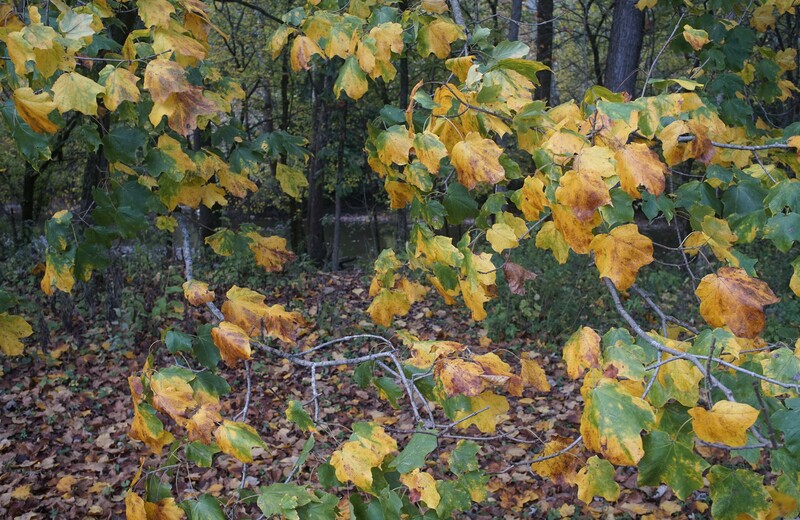 Changing leaves, Griggs Reservoir Park, (Donna). 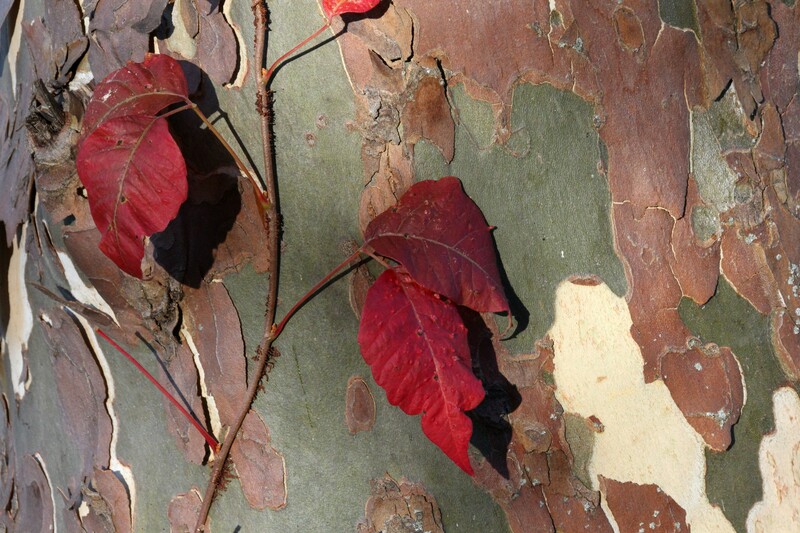 Sycamore bark, Griggs Reservoir Park. Red, yellow, green, Griggs Reservoir Park, (Donna). Suspended color along the Scioto River. 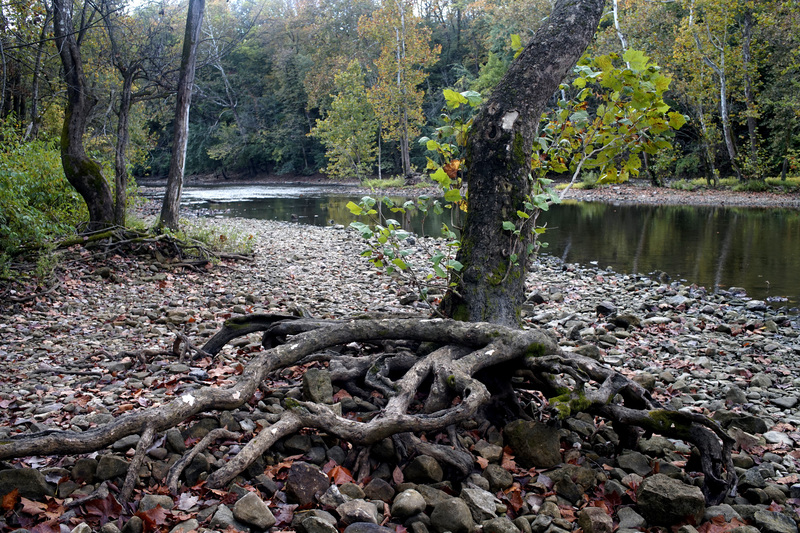 Rocks often washed by the river’s high water are now covered with the litter of trees. 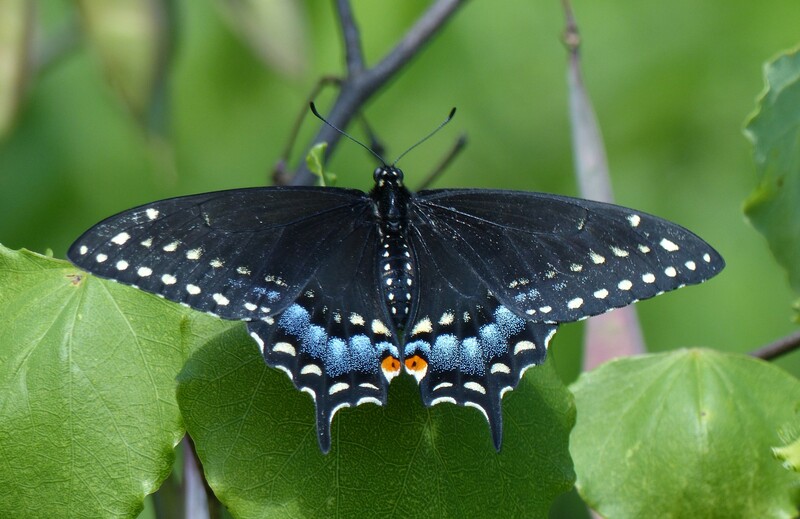 We often journey into nature equipped with expectations, perhaps it’s seeing a certain bird, insect, or wildflower, but the key to the magic may be to let go, allowing each day, each season, to speak in it’s own voice. 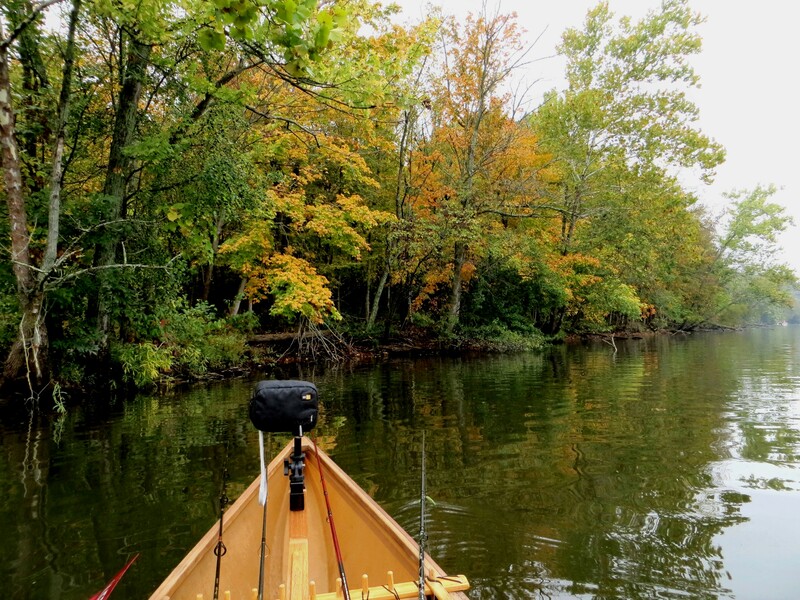 Autumn from the canoe, Griggs Reservoir. 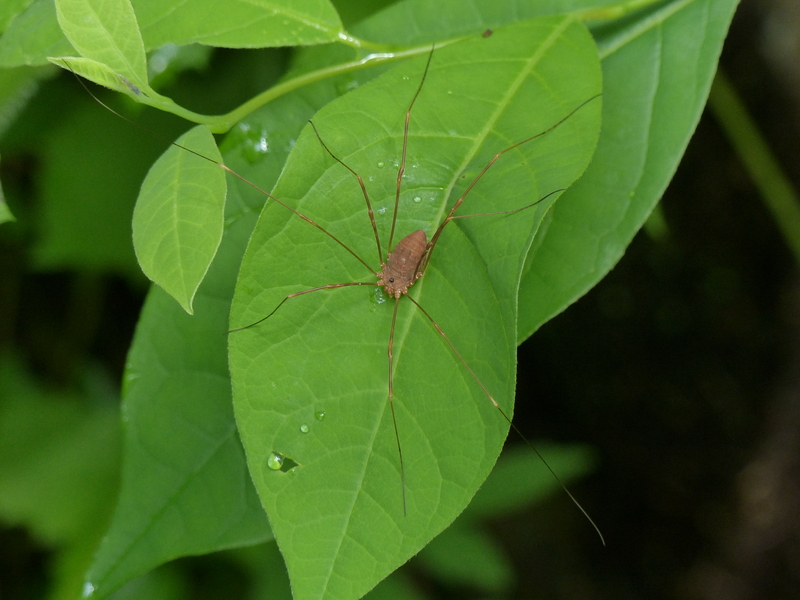 It had been about a year since we visited Bigelow Cemetery State Nature Preserve and Big Darby Headwaters Nature Preserve , so we thought a road trip was in order to see what we might find in the way of insects and other wildlife. 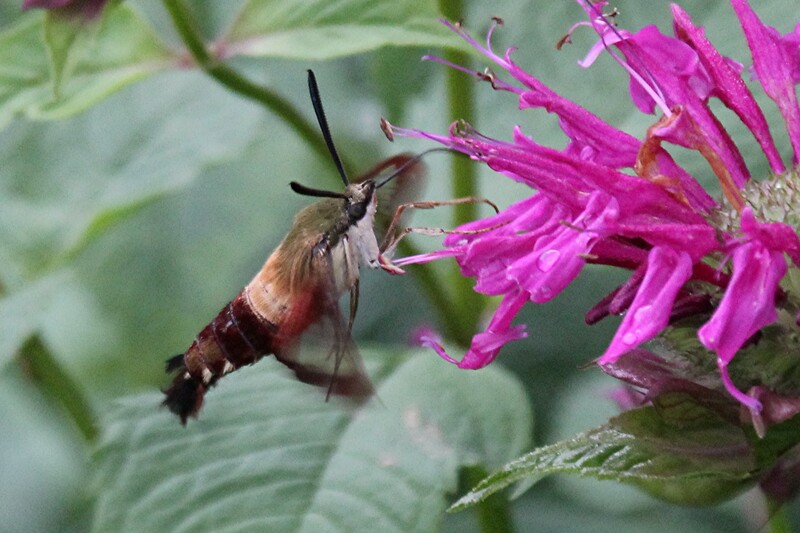 Last year we had seen a number of hummingbirds at Bigelow so we thought that might be the case again. 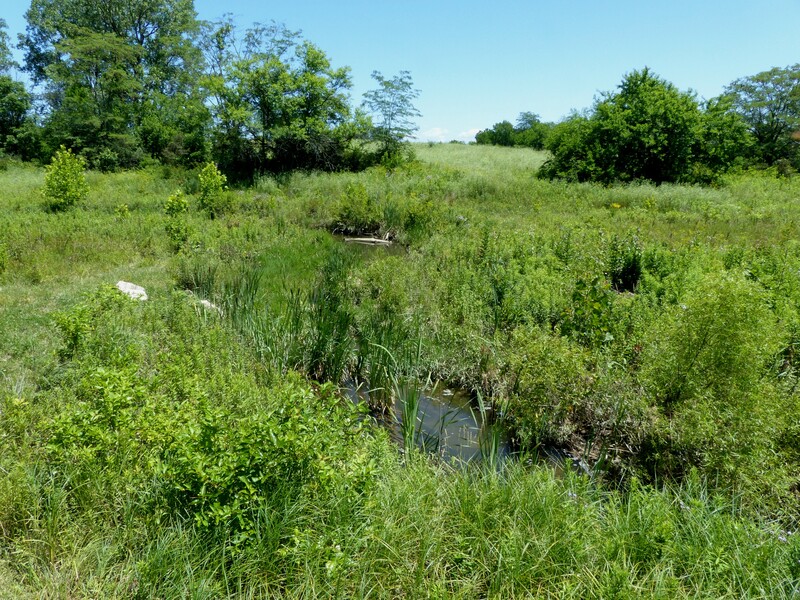 Unlike Bigelow, which is a very small plot of native prairie, Big Darby Headwaters is a much larger area and one we have only begun to explore. 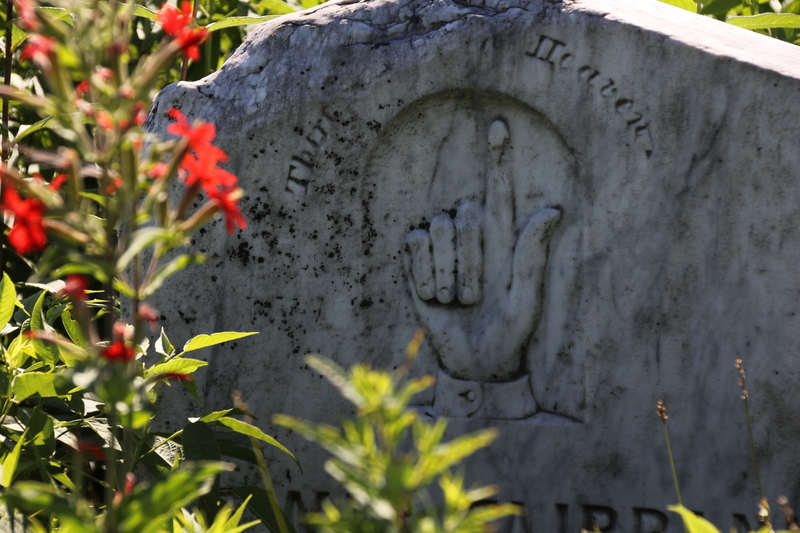 Repeated visits throughout the year would be best to get to know and really appreciate these areas. We usually have to satisfy ourselves with less. The first thing one notices upon arriving at Bigelow is how small it is, only about one half acre. The initial thought is that such a small area shouldn’t take long to explore. An hour and a half later we left and could have easily stayed longer if the Big Darby Headwaters had not beckoned. The number of living things in this small area compared to the surrounding farm field monoculture was mind boggling. 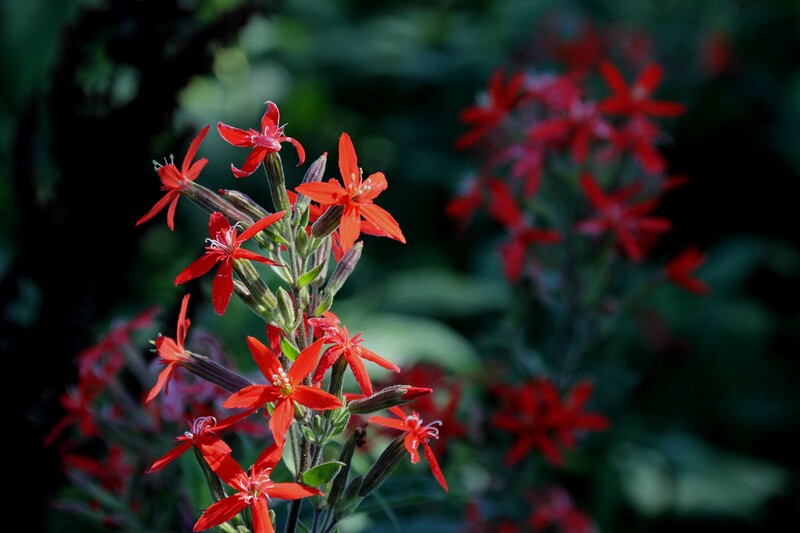 Royal Catchfly, Bigelow Pioneer Cemetery. 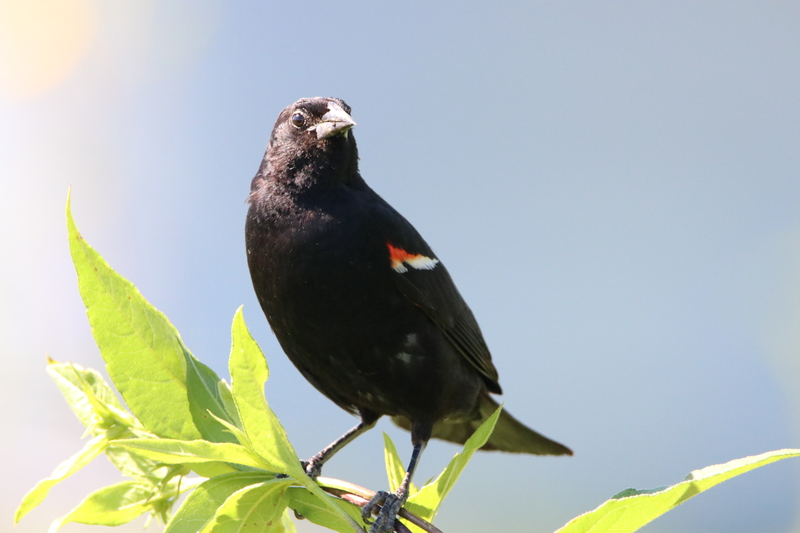 A male Red-winged Blackbird seemed concerned about our presence. Perhaps a nest was nearby. 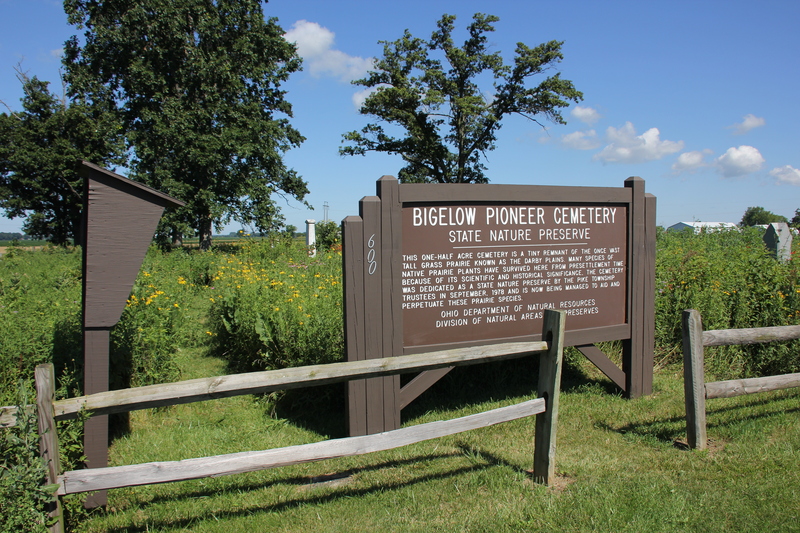 Bigelow Pioneer Cemetery. 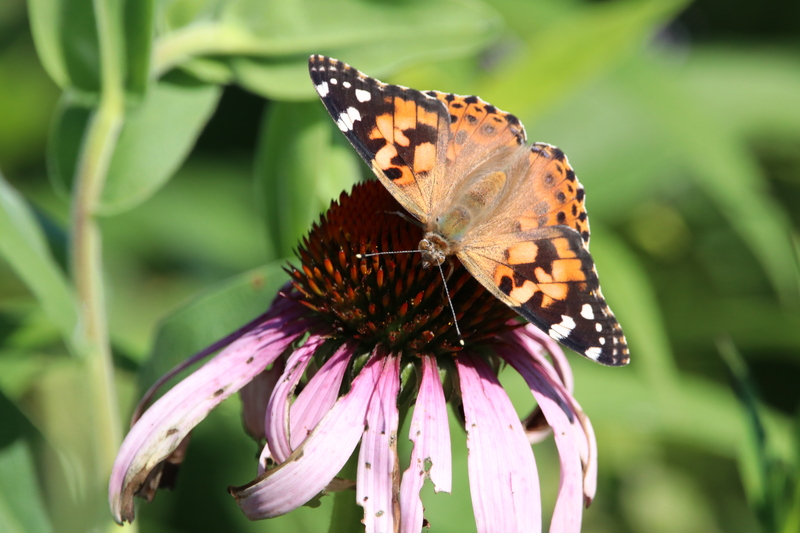 Painted Lady butterflies were common at Bigelow Pioneer Cemetery. 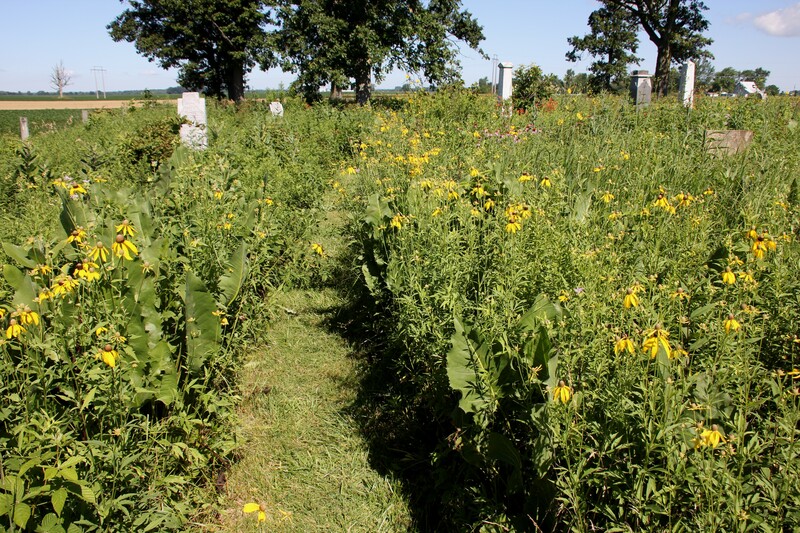 The cemetery is old by Ohio standards. 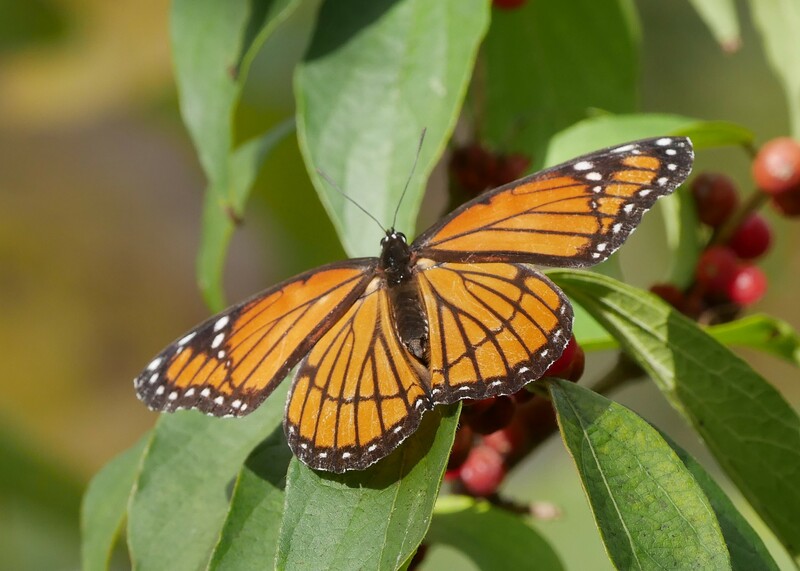 A Monarch Butterfly made up for the fact that no hummingbirds were seen, Bigelow Pioneer Cemetery. Donna takes aim on a wildflower, Bigelow Pioneer Cemetery. 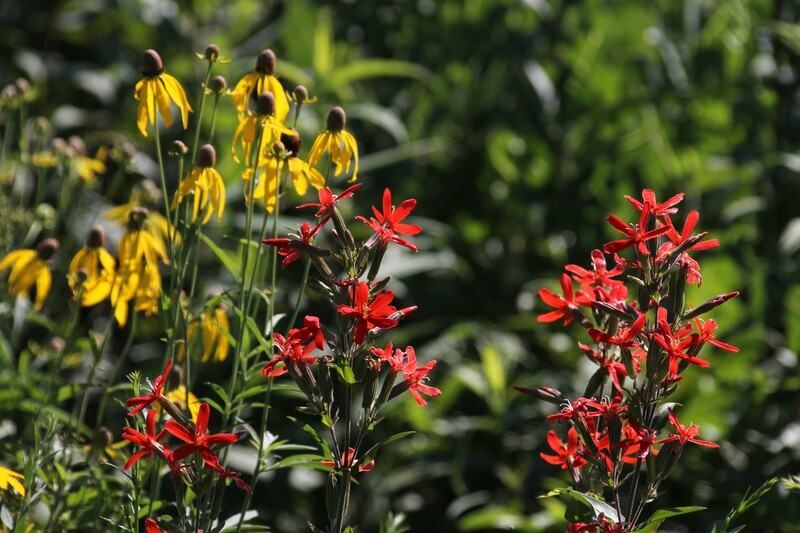 Gray Headed Cone Flowers and Royal Catchfly, Bigelow Pioneer Cemetery. 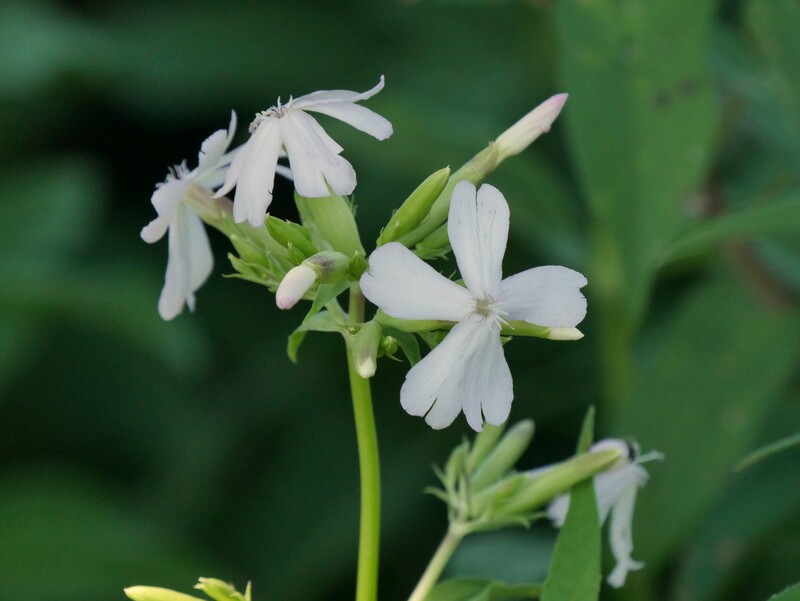 White Campion (alien), Bigelow Pioneer Cemetary, (Donna). 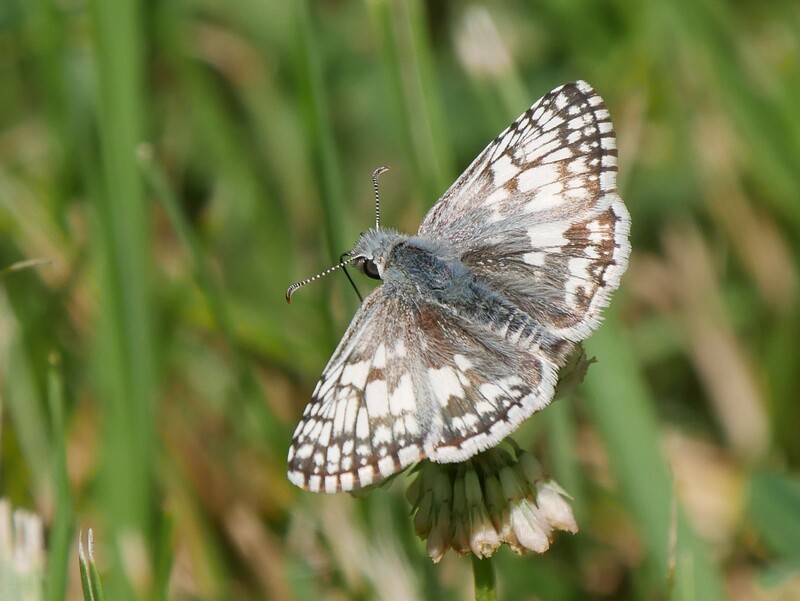 Common Checkered Skipper, Bigelow Pioneer Cemetery, (Donna). 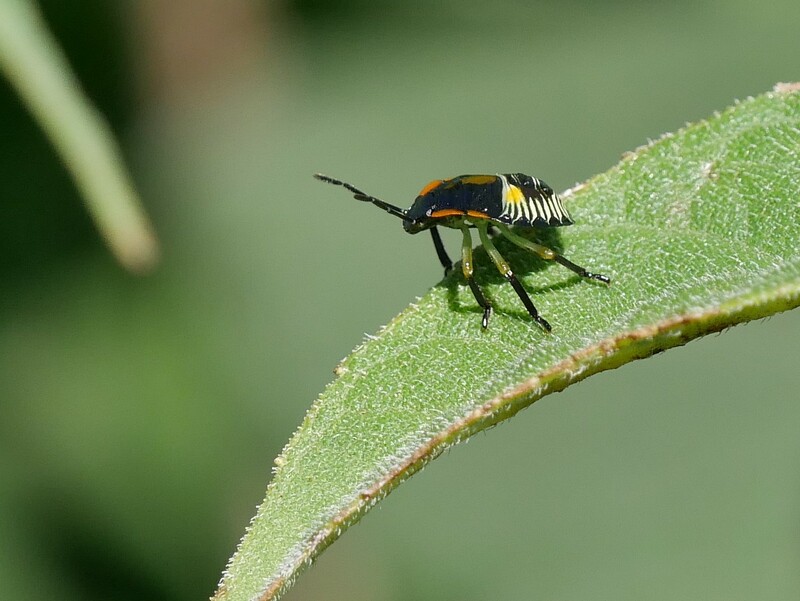 Stink Bug nymph, Bigelow Pioneer Cemetery, (Donna). 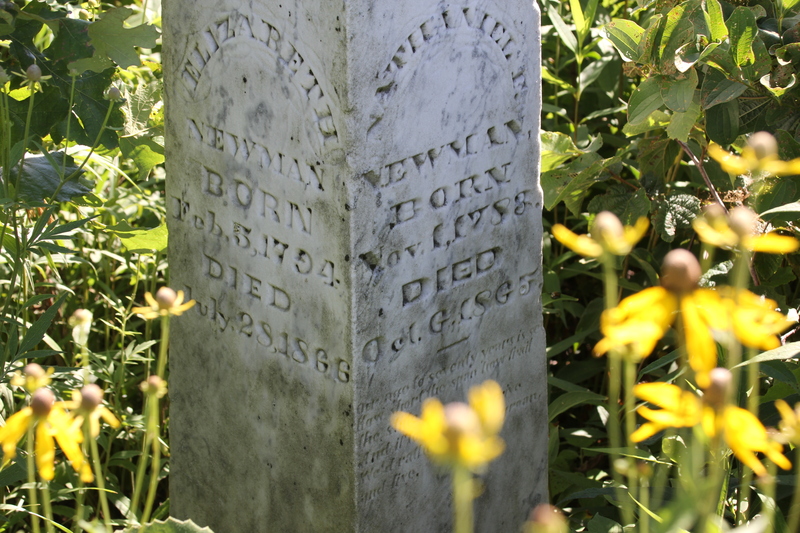 Familiar Bluet, Bigelow Pioneer Cemetery, (Donna). Having spent as much time as we thought we should at Bigelow, it was close to noon when we arrived at the Big Darby Headwaters. Usually not the best time of day to be out in nature. 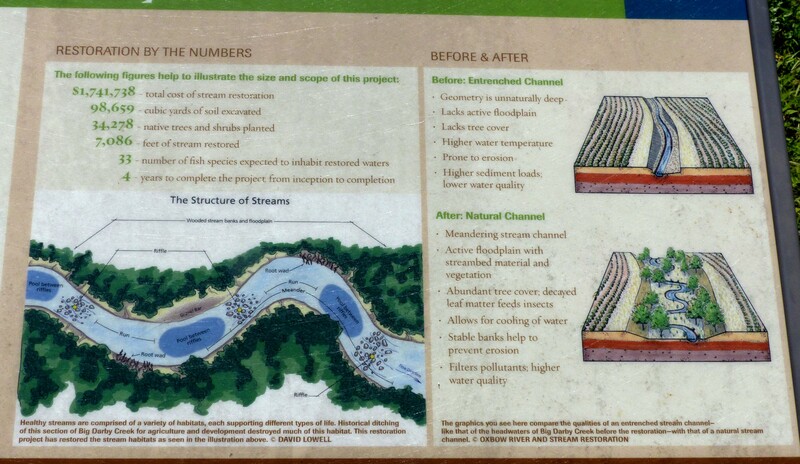 A fair mount of habitat restoration was required to make the Big Darby Headwaters NP what it is today, (Donna). 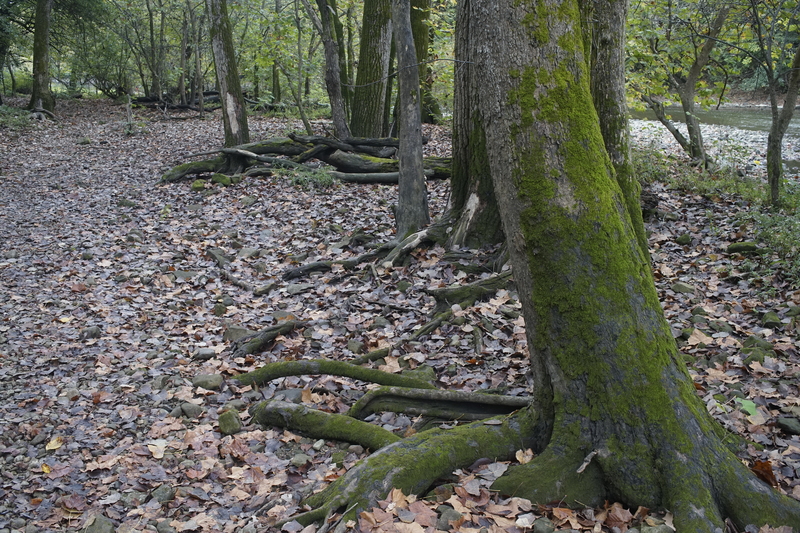 The hiking trail in Big Darby Headwaters Nature Preserve, (Donna). 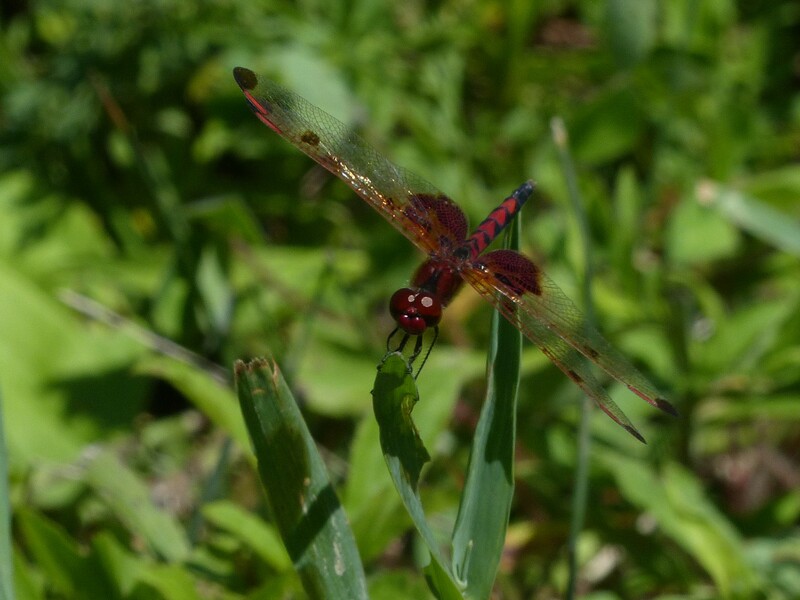 Calico Pennant Dragonfly, Big Darby Headwaters, (Donna). 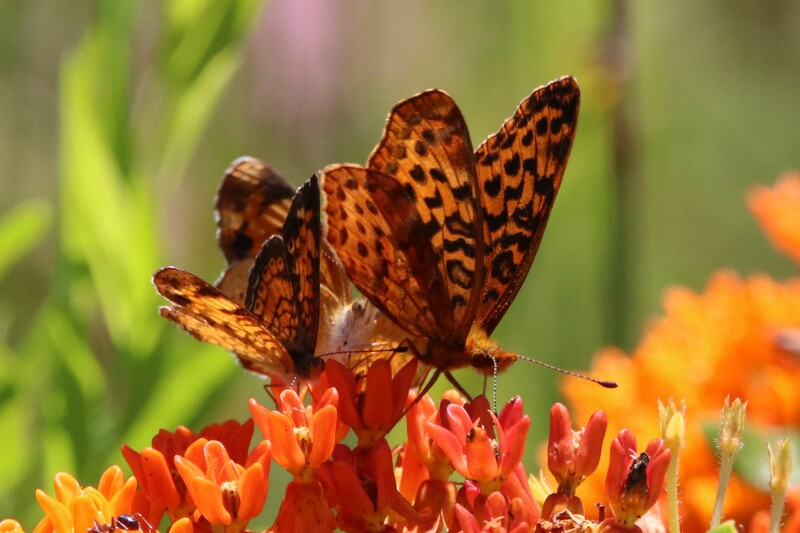 A Meadow Fritillary is joined by some of it’s closest friends on Butterfly Weed, Big Darby Headwaters. 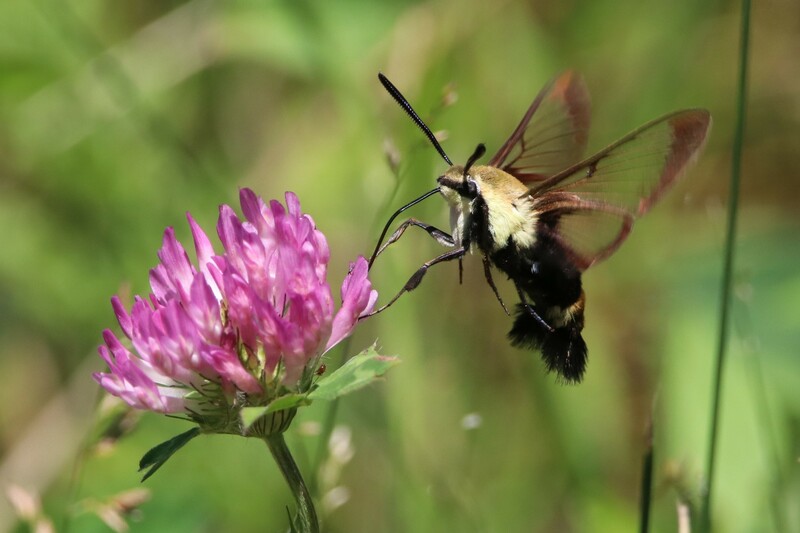 Snowberry Clearwing Moth, Big Darby Headwaters. 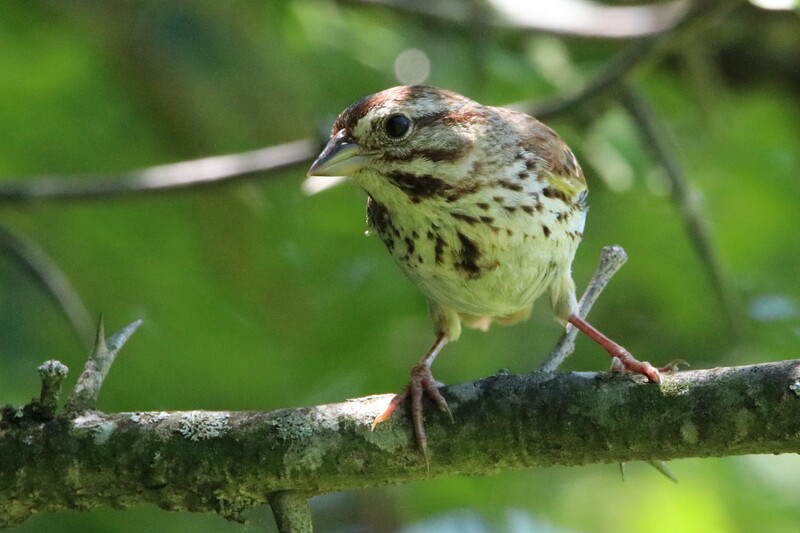 A curious Song Sparrow looks on, Big Darby Headwaters. 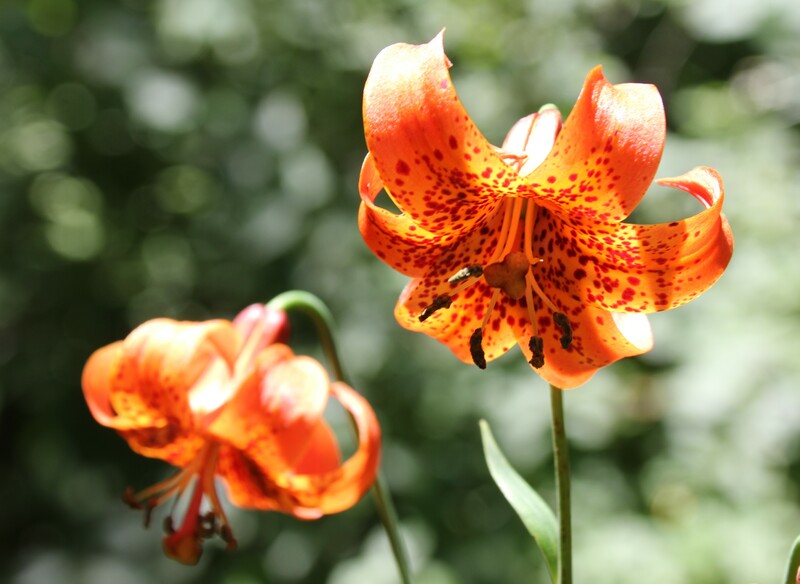 Michigan Lily, Big Darby Headwaters. 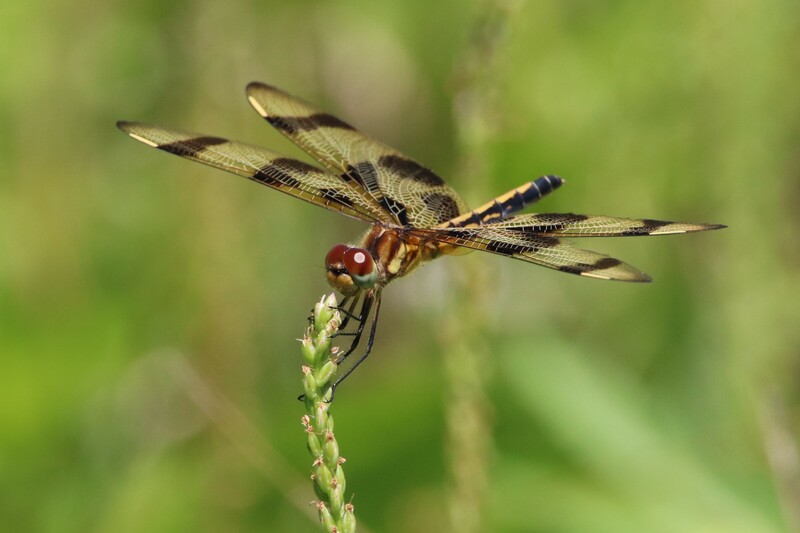 Halloween Pennant, Big Darby Headwaters, (Donna). 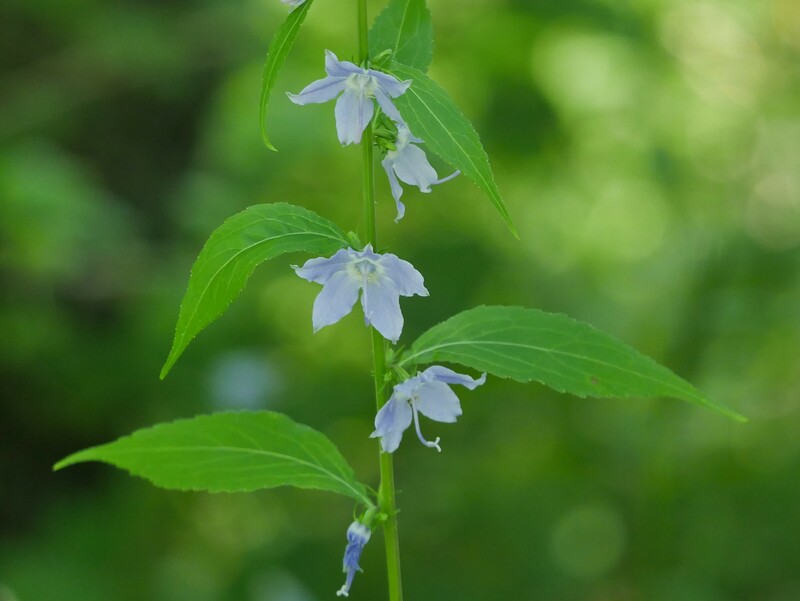 Tall Bellflower, Big Darby Headwaters, (Donna). 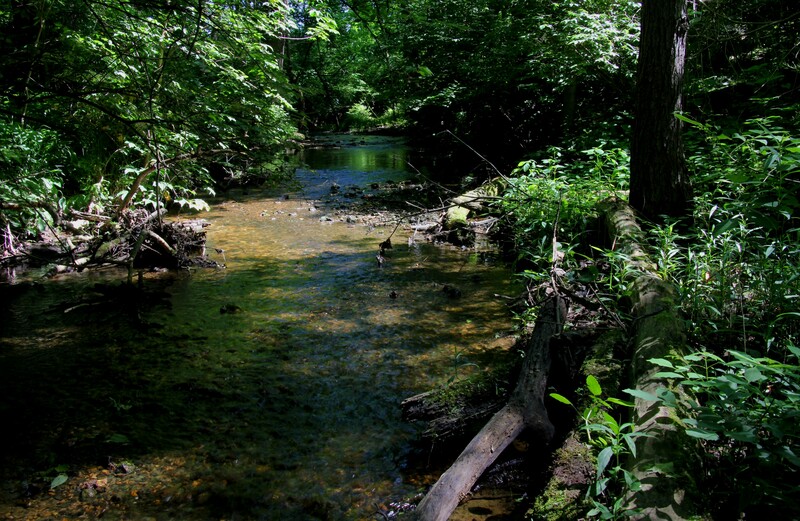 Stream, Big Darby Headwaters, (Donna). 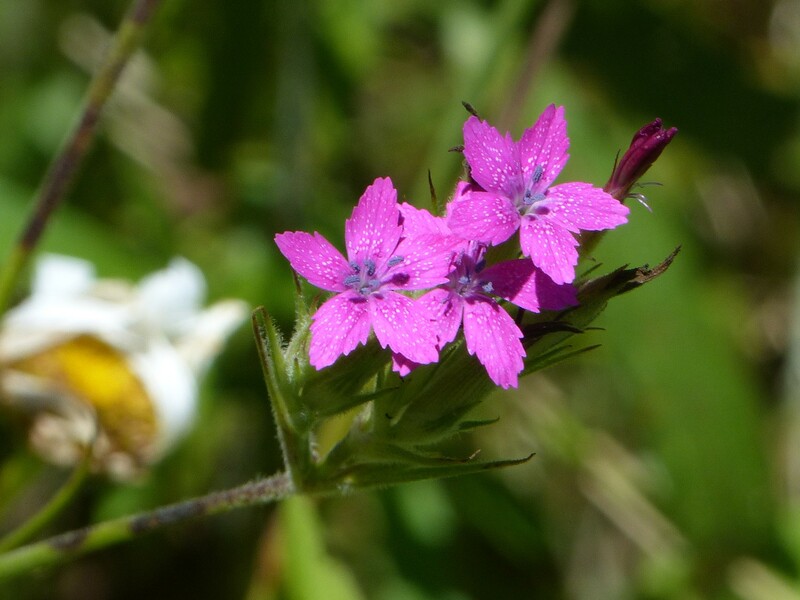 Depford Pink, Big Darby Headwaters, (Donna). Looking for a bird, Big Darby Headwaters. Over the past few days there’s been no shortage of things to see closer to home. 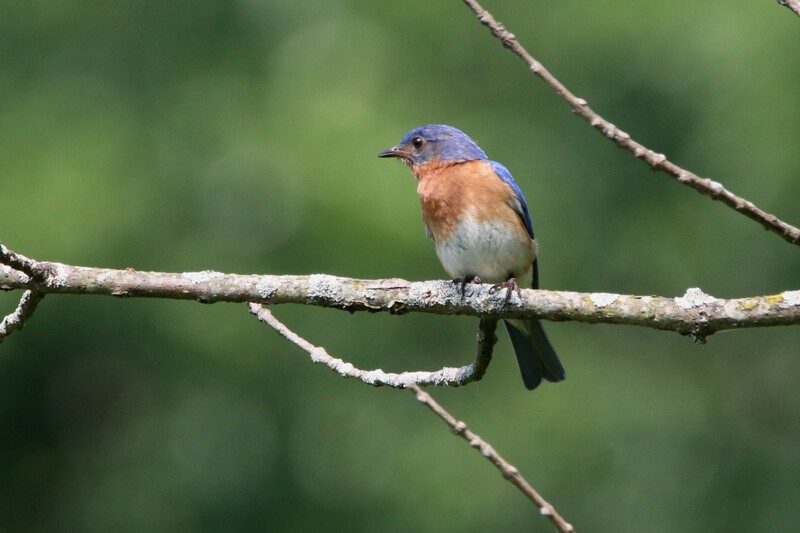 A male Bluebird watches, O’Shaughnessy Nature Preserve. 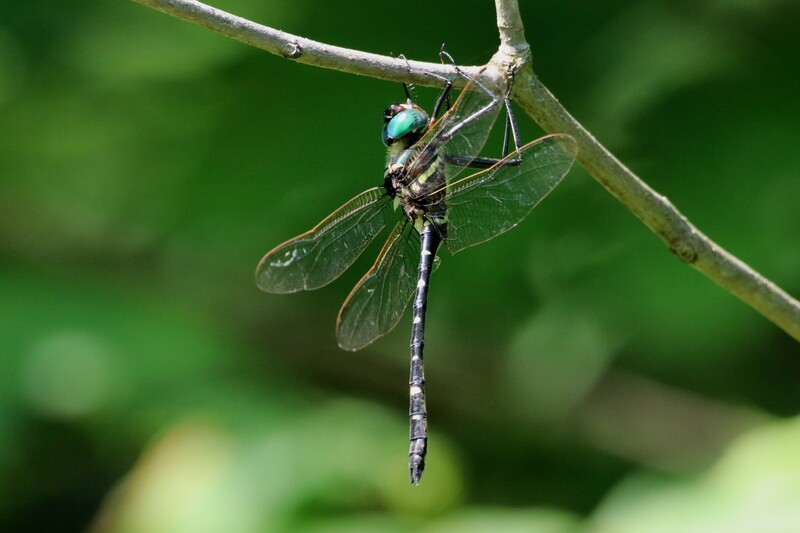 Royal River Cruiser, a new dragonfly for us! 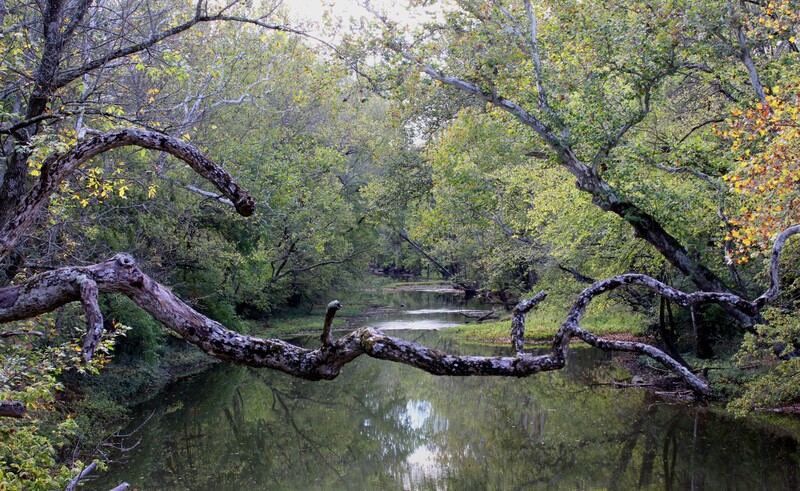 O’Shaughnessy Nature Preserve. 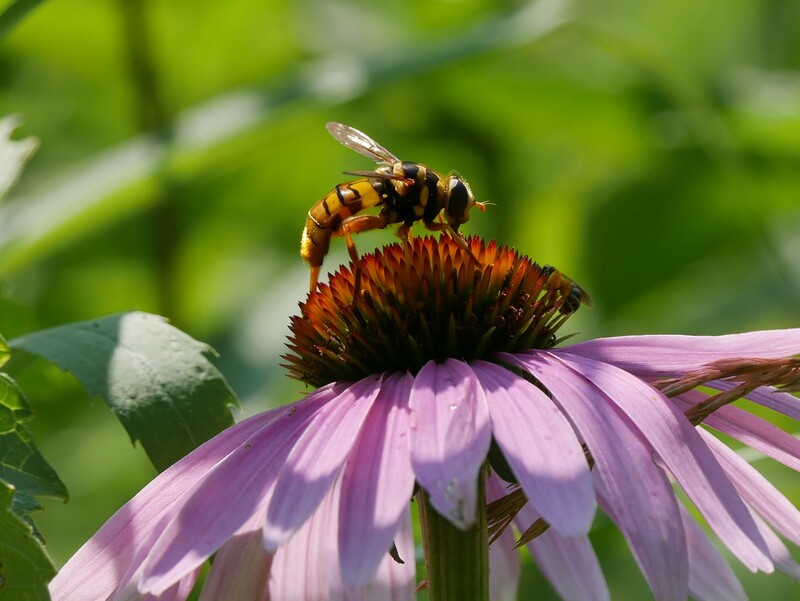 Yellow Jacket Hover Fly, O’Shaughnessy Nature Preserve, (Donna). 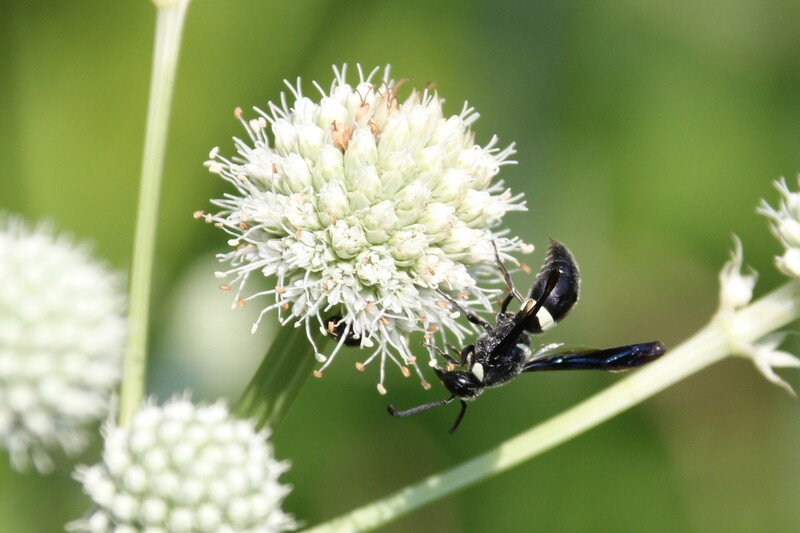 Four-toothed Mason Wasp on Rattlesnake Master Flower, O’Shaughnessy Nature Preserve. 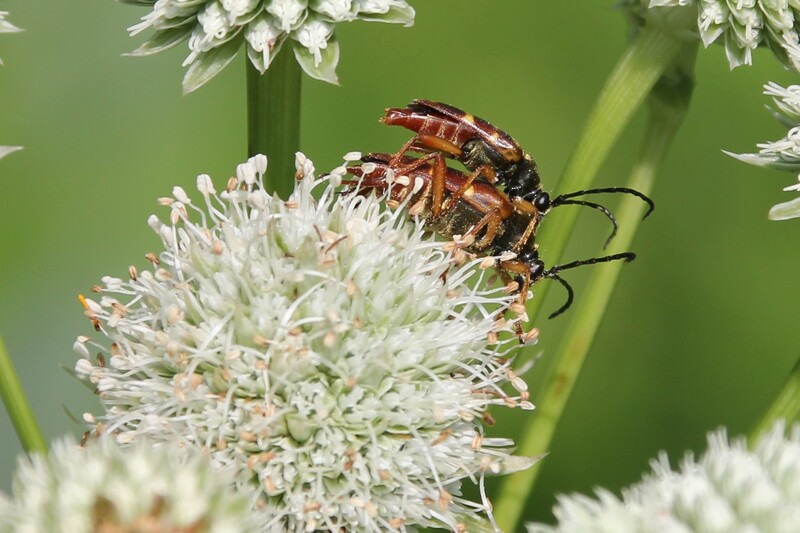 Banded Longhorn Flower Beetles, O’Shaughnessy Nature Preserve. 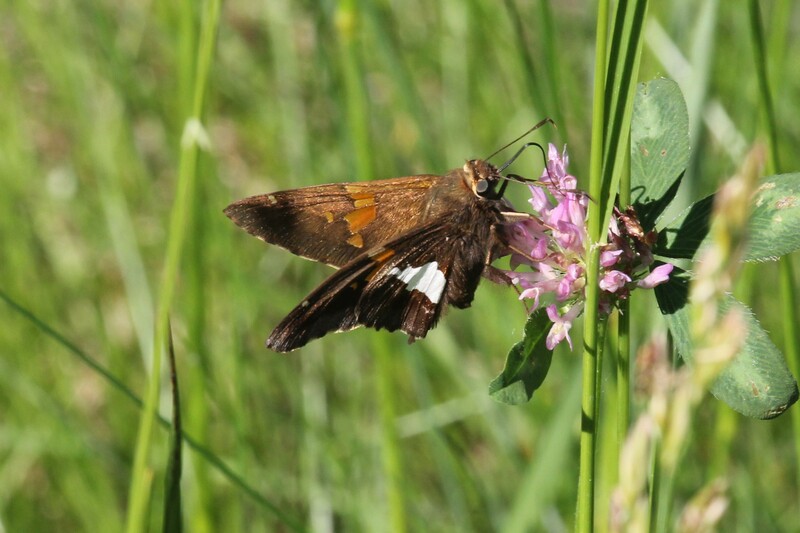 Silver Spotted Skipper, O’Shaughnessy Nature Preserve, (Donna). 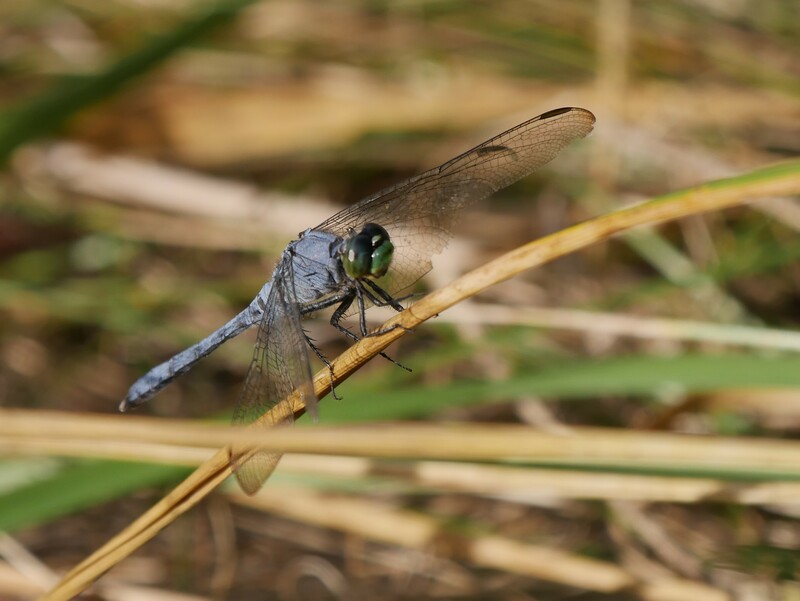 Female Eastern Pondhawk, Big Darby Headwaters. 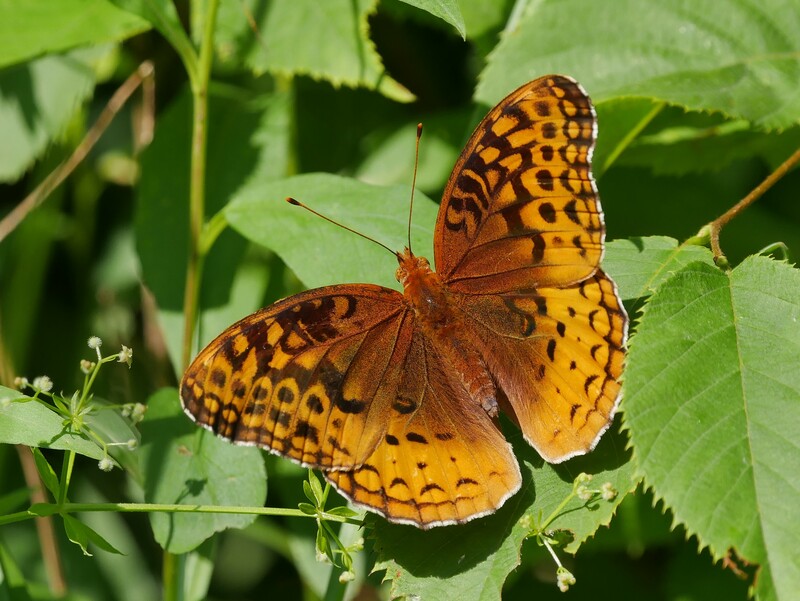 Great Spangled Fritillary, O’Shaughnessy Nature Preserve, (Donna). 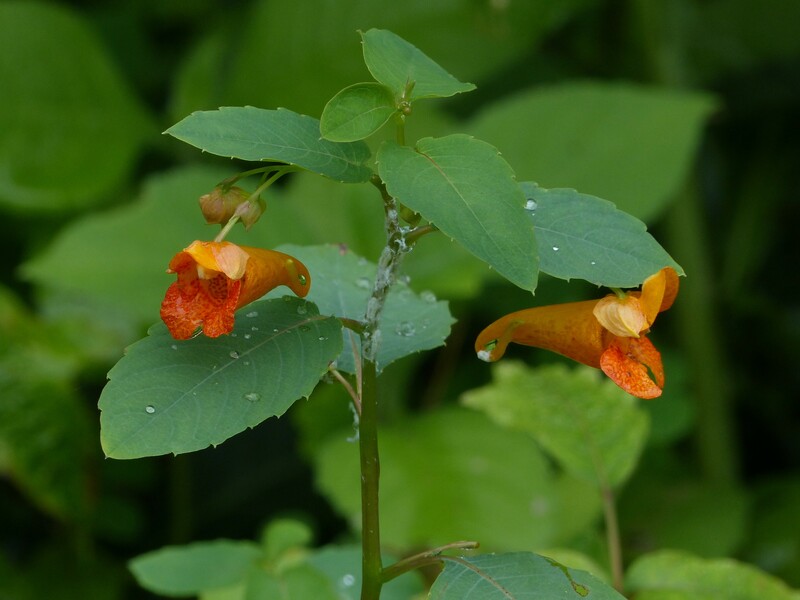 Jewelweed, O’Shaughnessy Nature Preserve, (Donna). 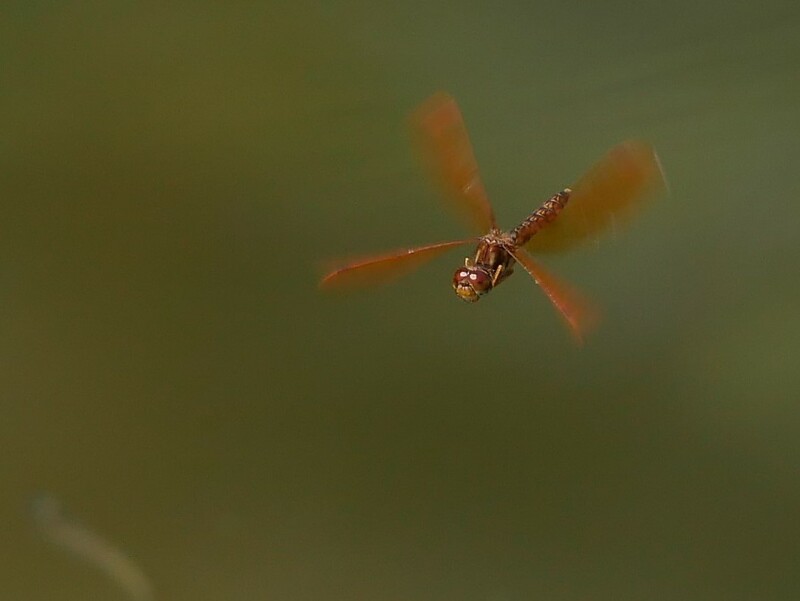 Eastern Amberwing, O’Shaughnessy Nature Preserve, (Donna). 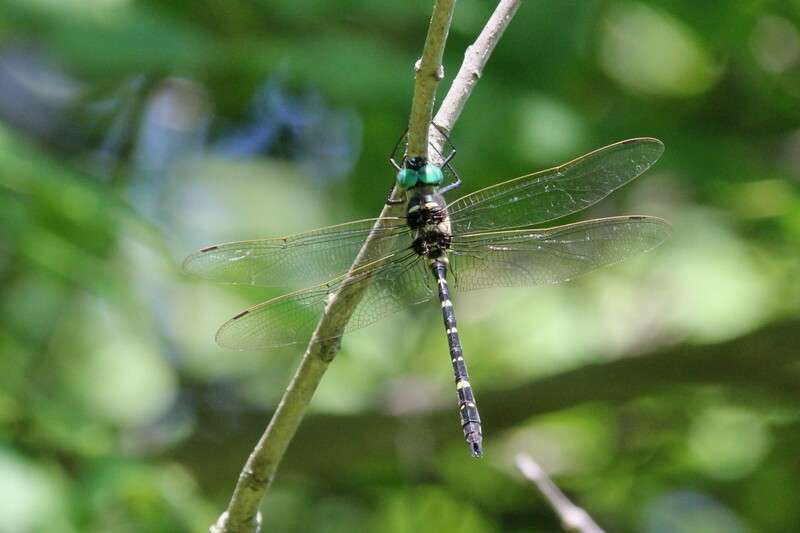 Common Whitetail (F), Big Darby Headwaters. 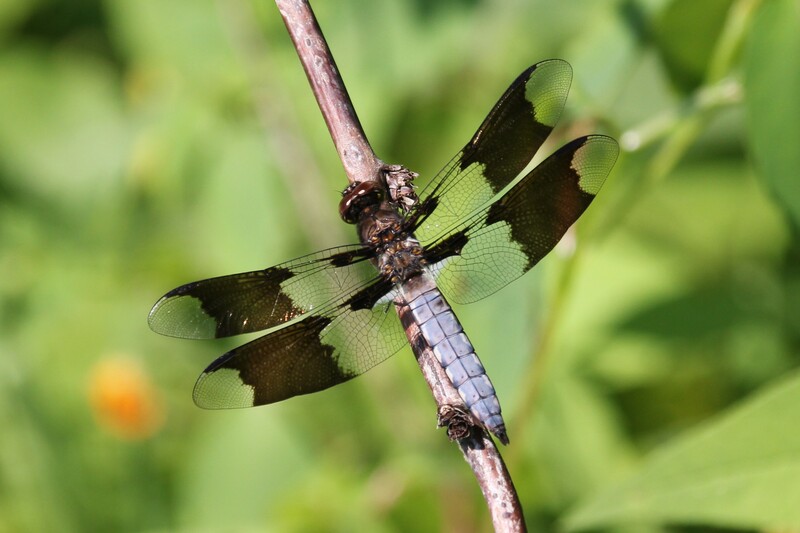 Common Whitetail (M), O’Shaughnessy Nature Preserve. 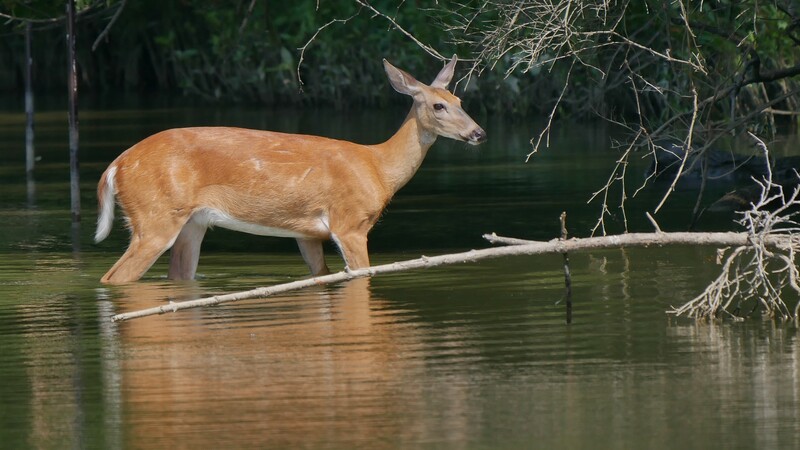 White Tail Deer, O’Shaughnessy Nature Preserve, (Donna). Even in our backyard . . . I continue to think about the diversity and abundance of life at Bigelow. 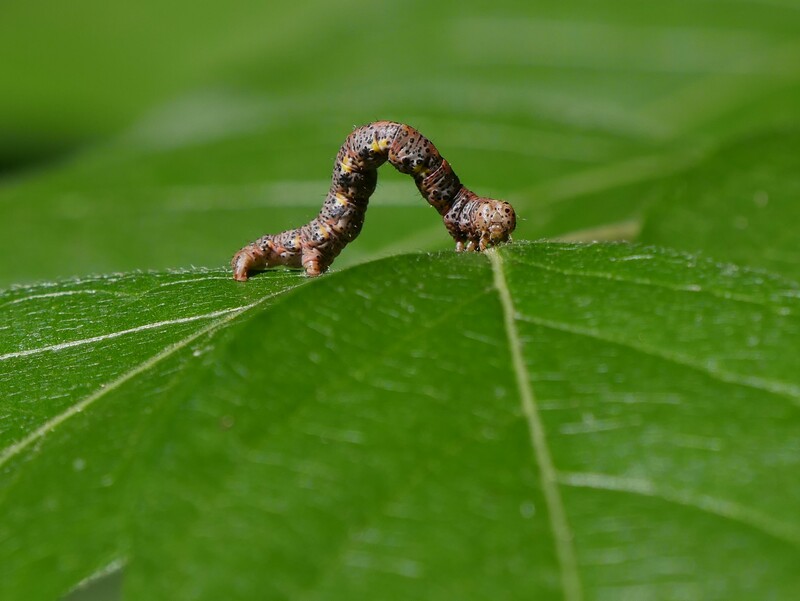 It may be reasonable to expect that if such places were more numerous or extensive such diversity and abundance might not be as noticeable as the creatures observed there would have more options. However, forgetting for a moment the pollution of the air and water due to human activities, it’s still hard not to wonder about the long term sustainability of the planet when so much acreage has been, and continues to be, developed. Once developed it often becomes just another barren monoculture which at best grows crops that feed us or worse becomes another woods or meadow roofed over for industry, commerce, or shelter, or paved over so that we can drive or park our cars. 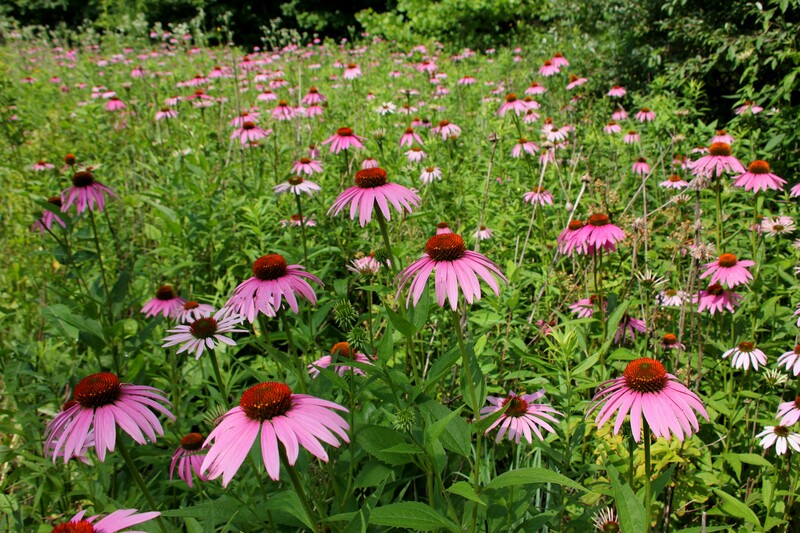 While more far-reaching solutions are undoubtedly necessary, in the short term planting more wildflowers in lieu of maintaining an extensive lawn might be worth our consideration. 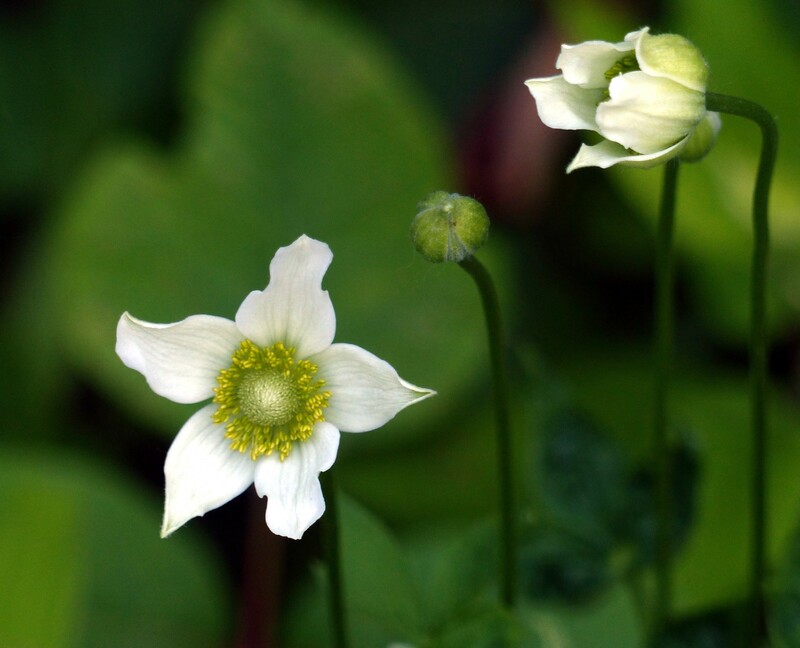 Nature unfolds and reveals itself like a flower, first reluctantly and then with grace. Armed with just a little curiosity, looking with intention, and allowing yourself to be in the moment and place, rewards one with new wonder. Seeing and appreciating more each time. 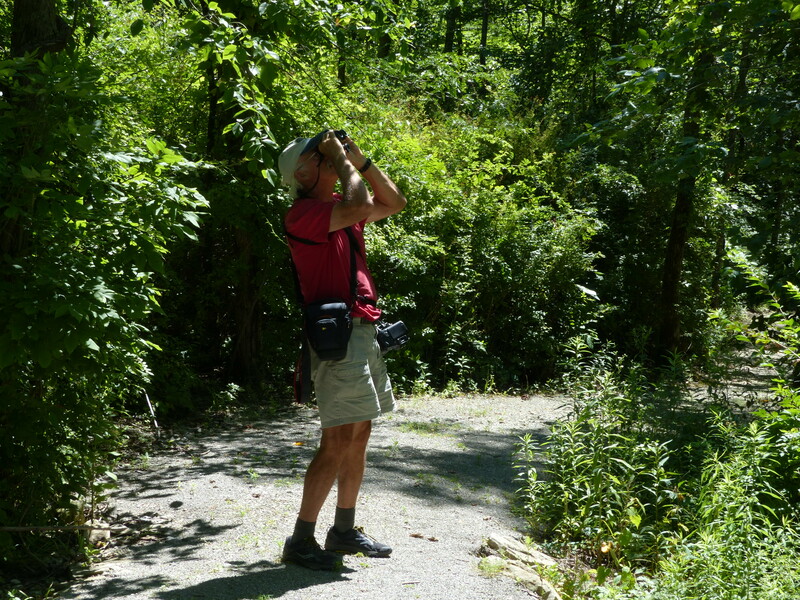 In the past few days, still interested in finding warblers, we visited Prairie Oaks Metro Park and closer to home Griggs Reservoir Park in the hopes of seeing a few stragglers. 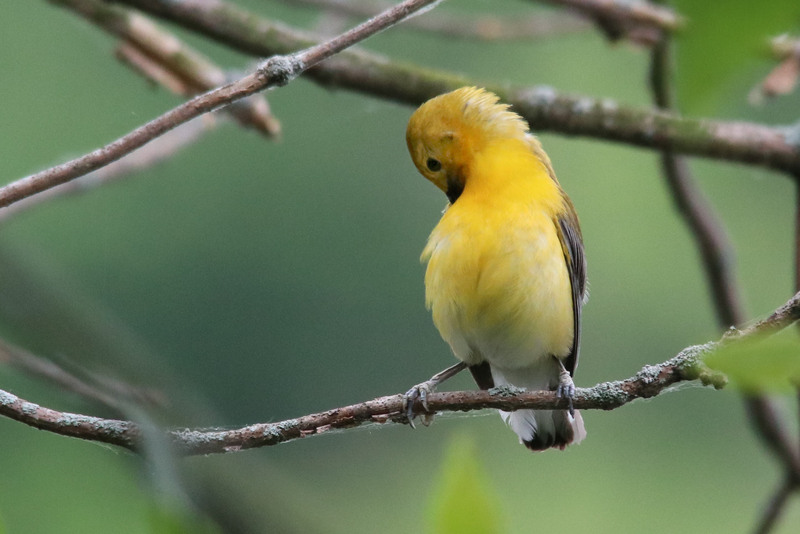 With the exception of the Prothonotary, the warblers didn’t cooperate but fortunately other things did. Whether it’s warblers or “other things” we’re always amazed by the celebration of life this time of year and the beauty that’s often found in the ordinary. 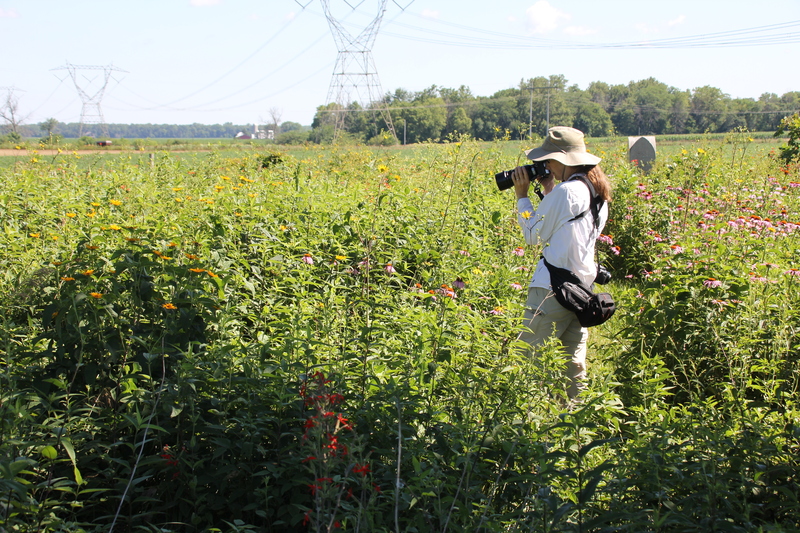 The pictures below were taken over just a few outings, typically involving walks of at least two or three miles, sometimes longer, as we search for birds, bugs, and plants. 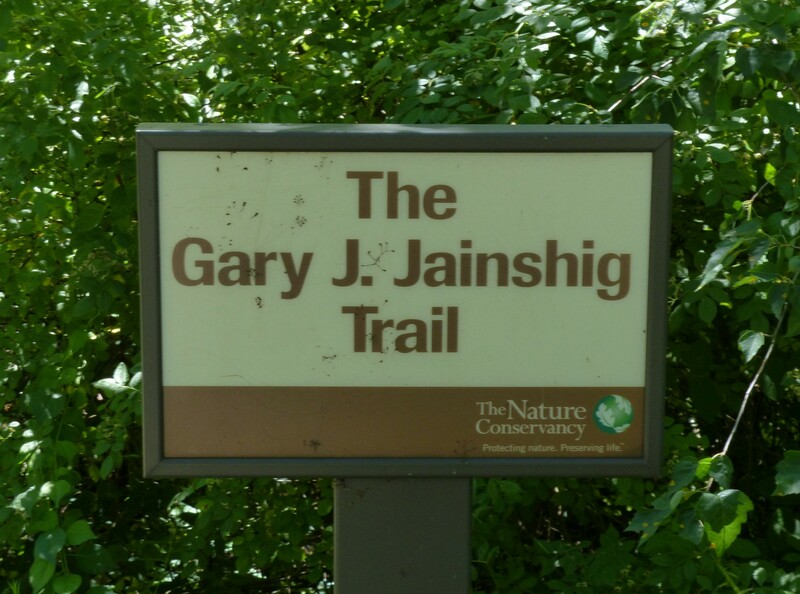 It is a source of continuous fascination that so much can be found so close to home in central Ohio. 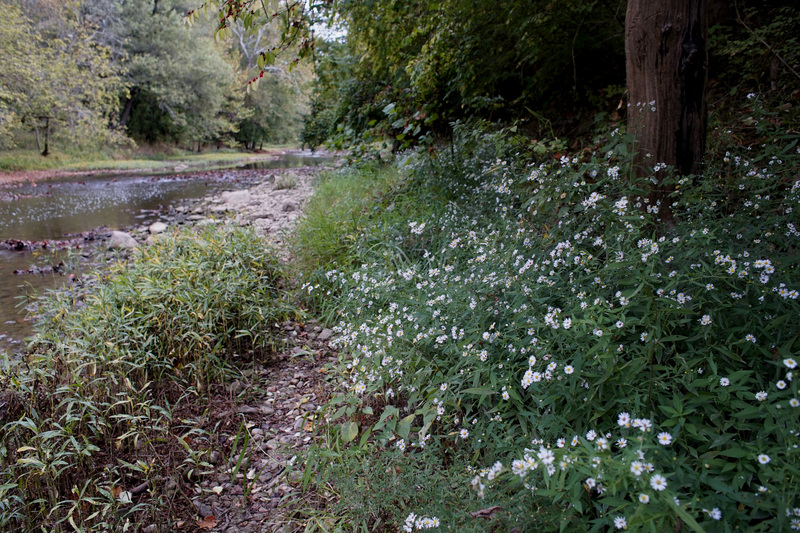 A shaft of light finds grass along a stream, Prairie Oaks Metro Park. It’s always nice when “the reptiles” decide to join the cast. 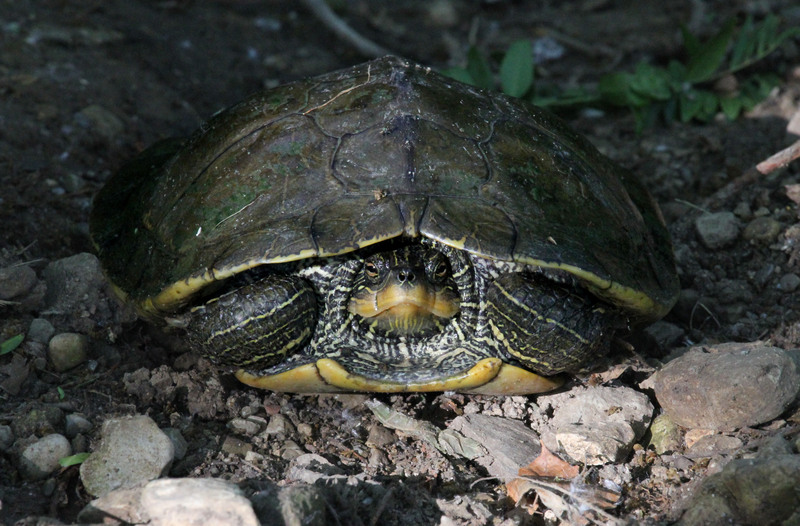 Next to the path a turtle acts none to happy about our presence, Prairie Oak Metro Park. 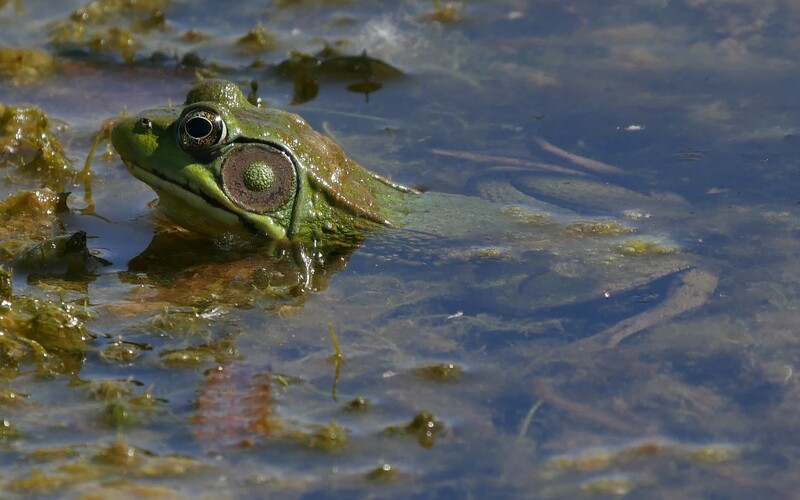 A Bullfrog shows a nice profile, Prairie Oaks Metro Park, (Donna). Still in “warbler mode” on a recent outing, we weren’t prepared for all the insects we would see. 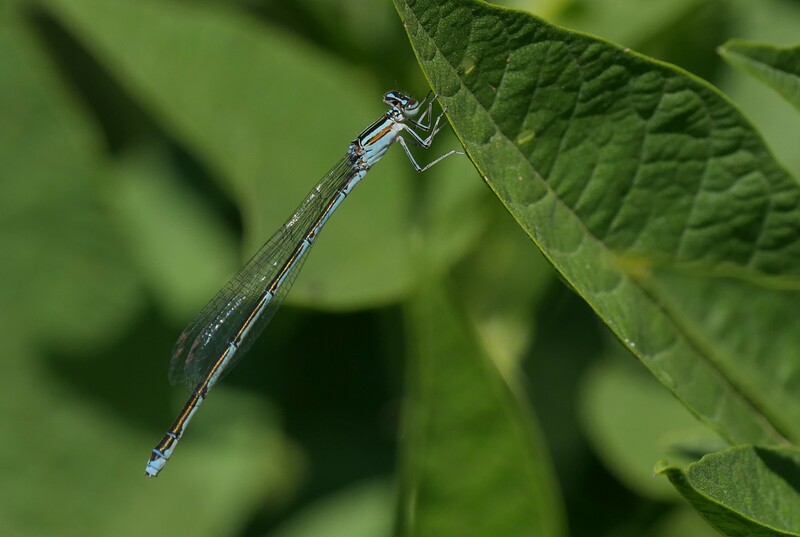 Familiar Bluet, Prairie Oaks Metro Park, (Donna). 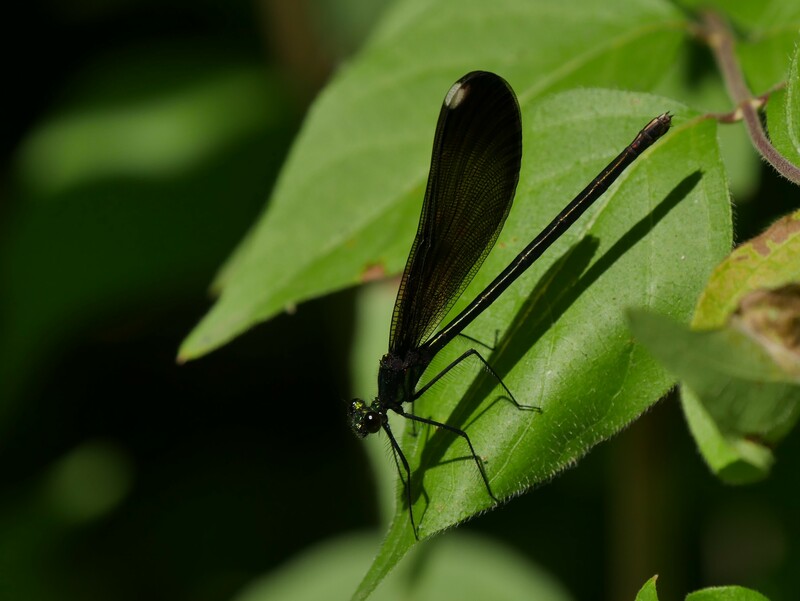 Ebony Jewelwing Damselfly, Prairie Oaks Metro Park, (Donna). 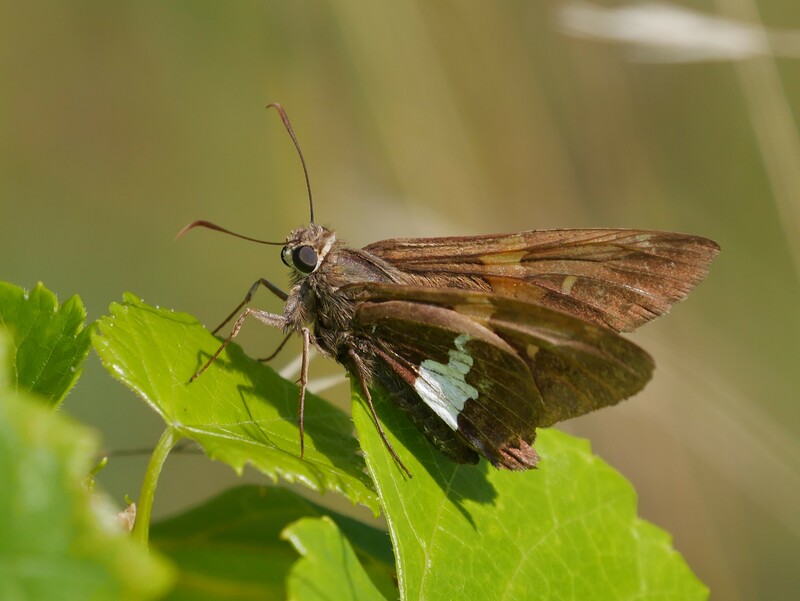 Silver Spotted Skipper, Prairie Oaks Metro Park. 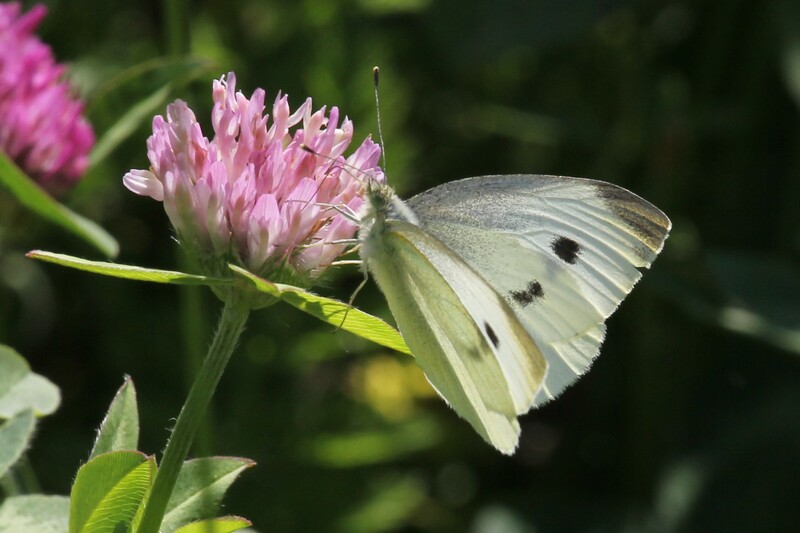 A very common Cabbage White, Griggs Reservoir Park. 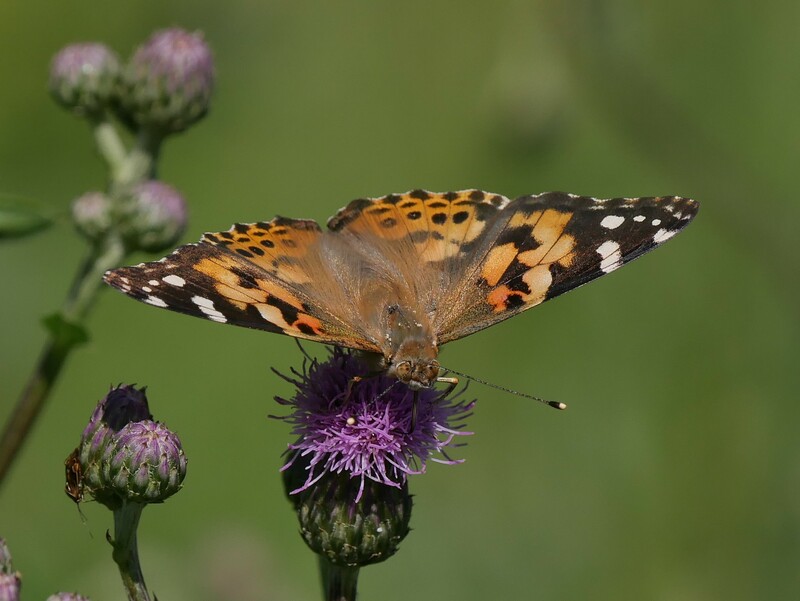 Painted Lady, Prairie Oaks Metro Park, (Donna). 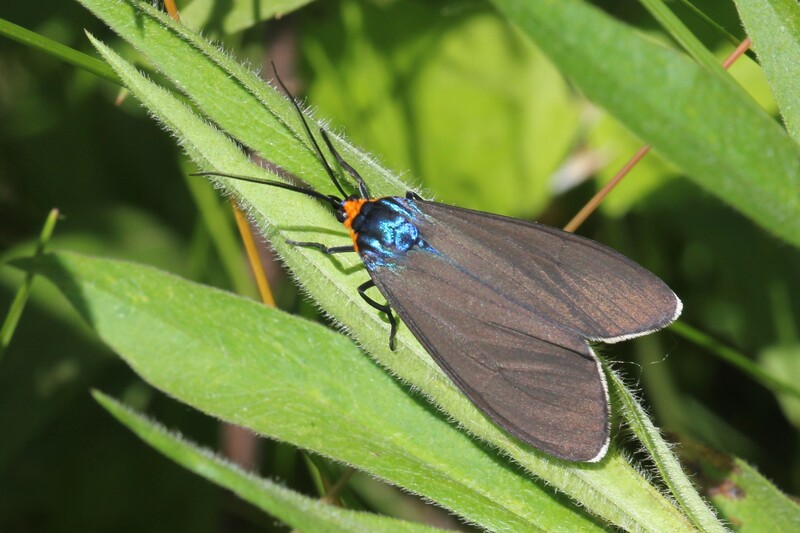 Virginia Ctenucha, Prairie Oaks Metro Park. 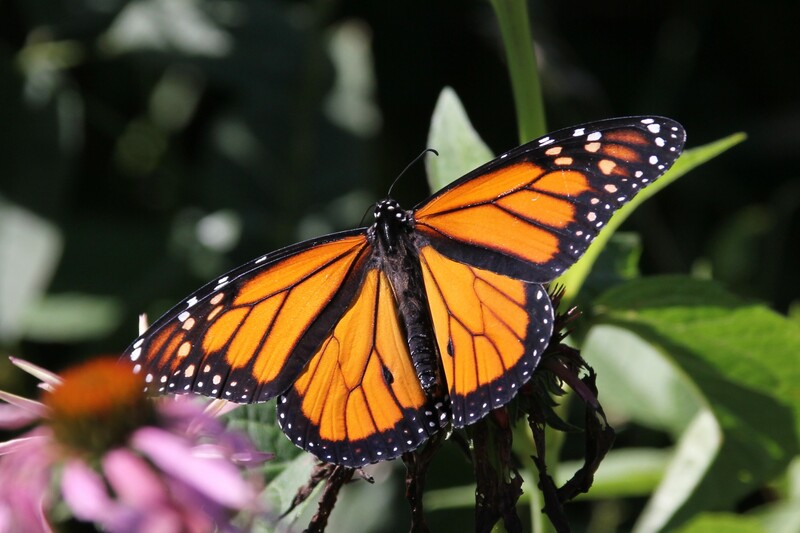 Viceroy, Prairie Oaks Metro Park. 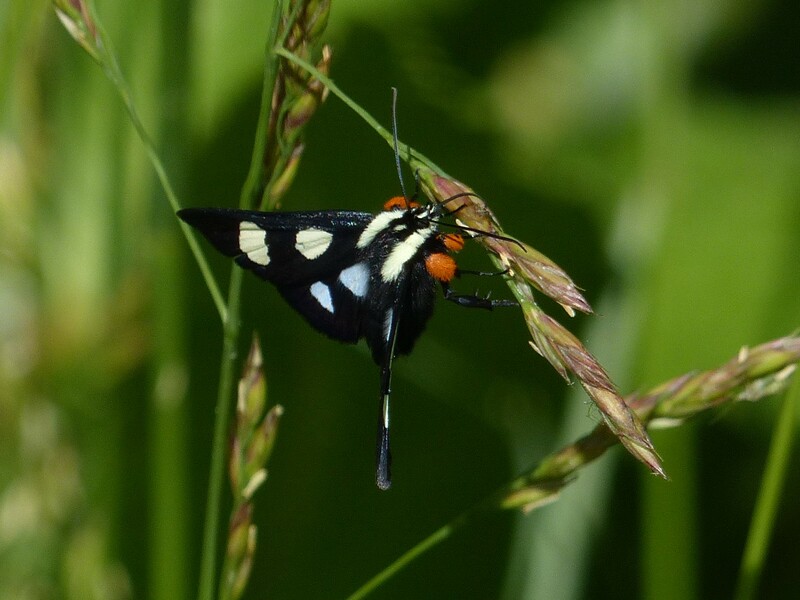 Eight-spotted Forester Moth, Prairie Oaks Metro Park, (Donna). 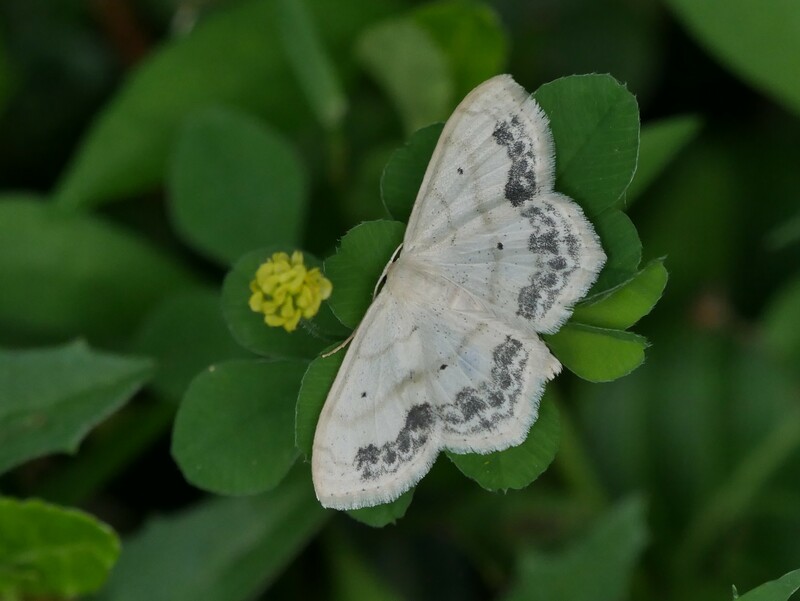 Large Lace-boarder Moth, Griggs Reservoir Park, (Donna). 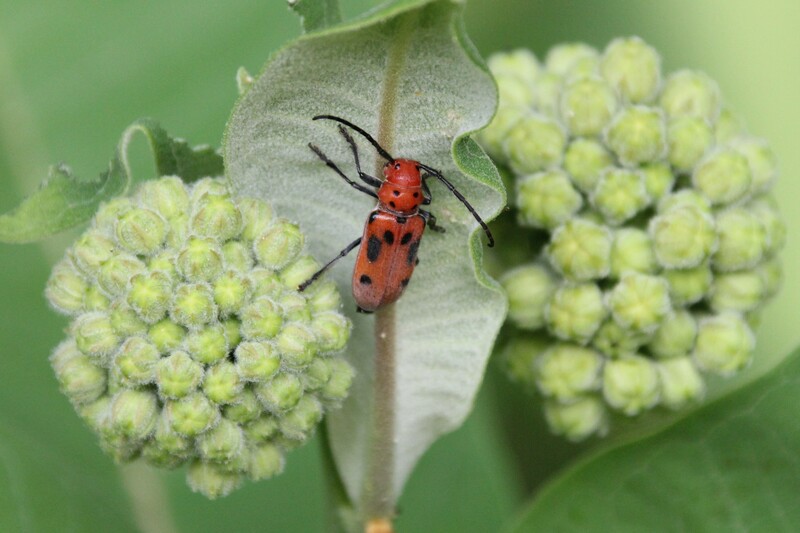 Milkweed Beetle, Griggs Reservoir Park. 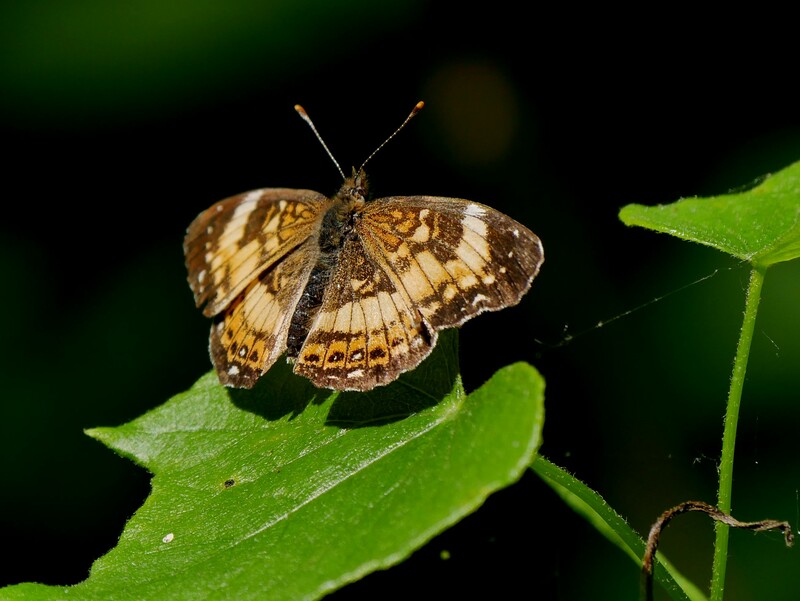 Silvery Checkerspot, Prairie Oaks Metro Park, (Donna). 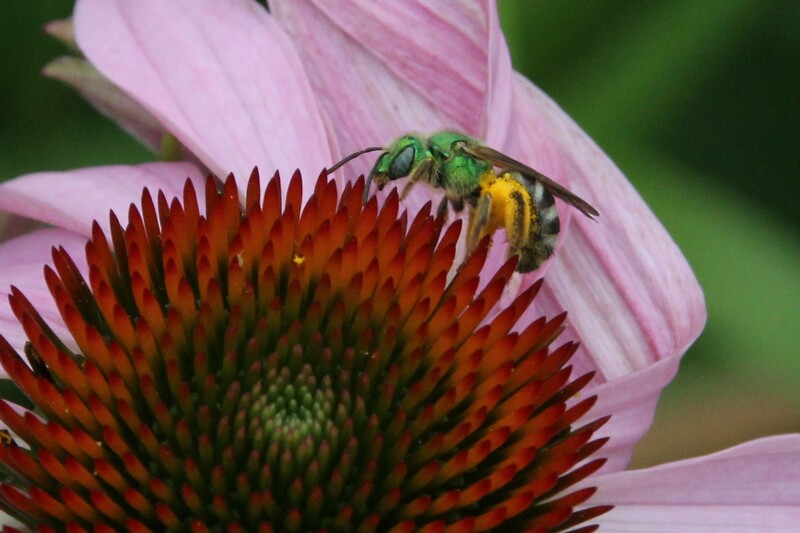 Green Bee on Coneflower, Griggs Reservoir Park. 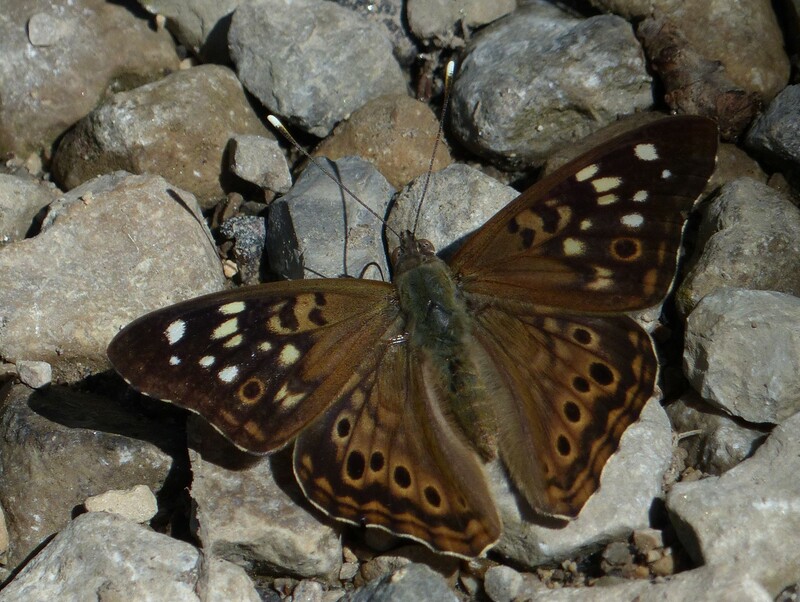 Hackberry Emperor, Griggs Reservoir Park, (Donna). 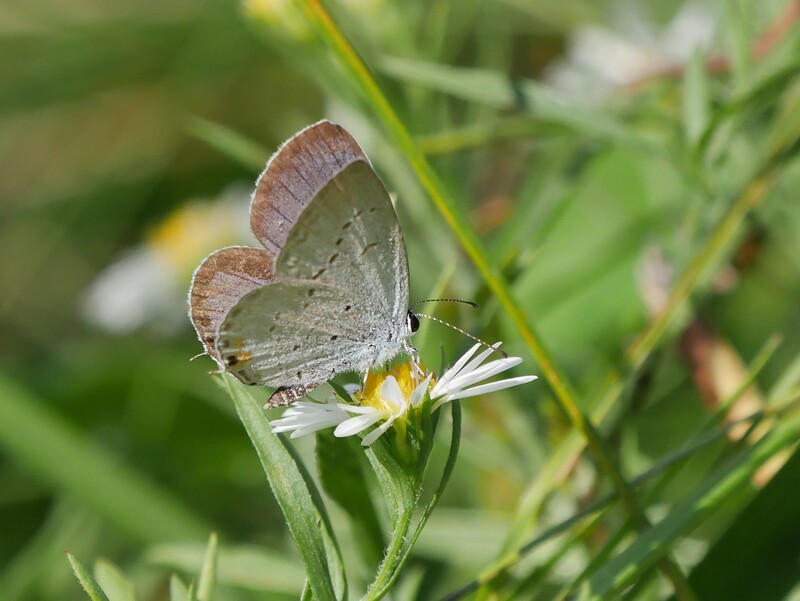 Where there are bees and butterflies there will be wildflowers or maybe it’s the other way around. 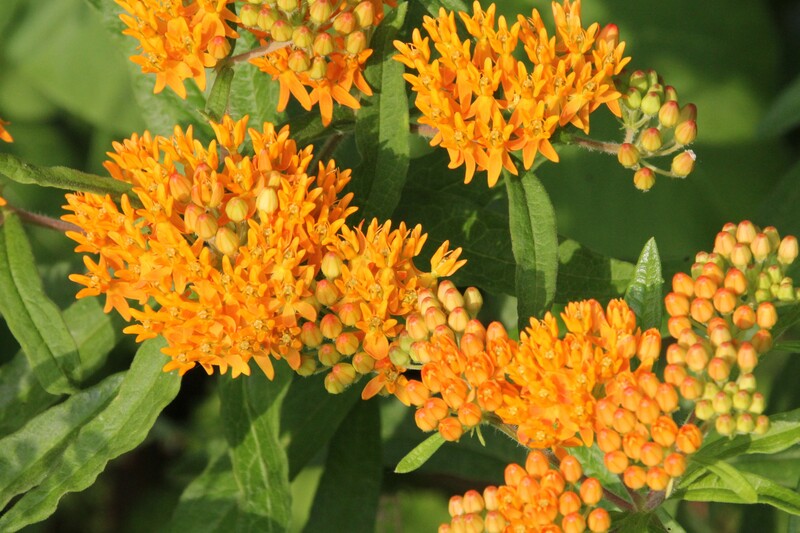 Butterfly Weed, Griggs Reservoir Park. 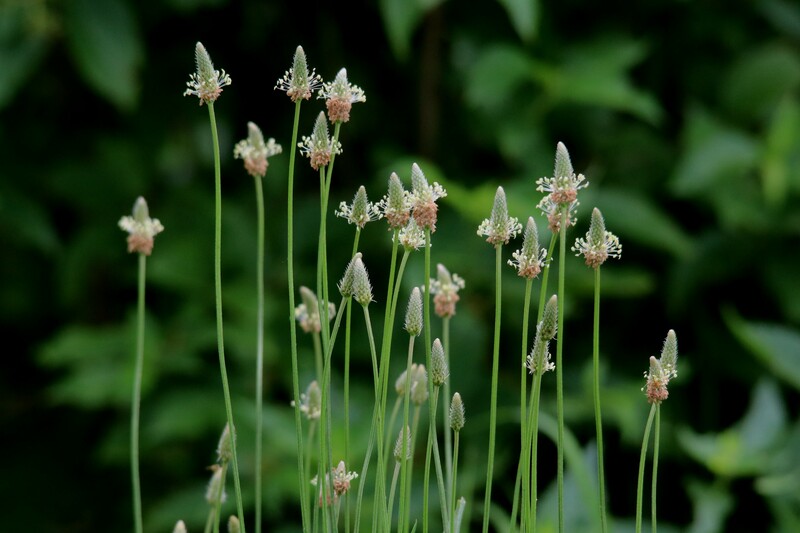 In grassy areas and meadows English Plantain is everywhere, Griggs Reservoir Park is no exception. 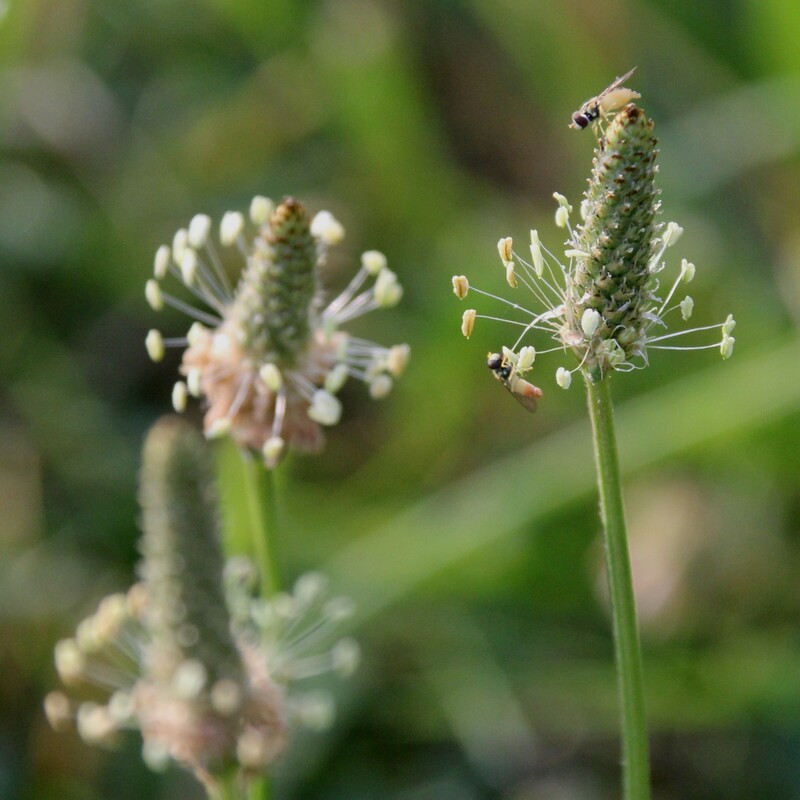 Very small bees visit the very small flowers of the English Plantain. 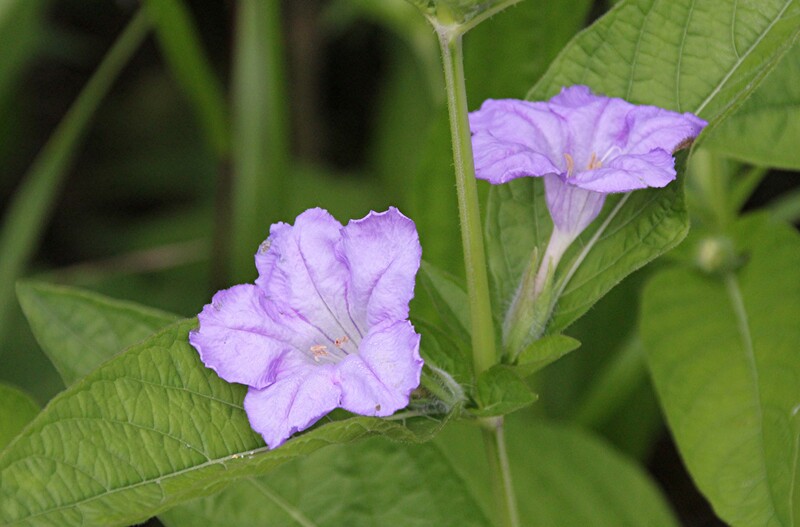 Hairy Wild Petunia (Ruellia humilis), Griggs Reservoir Park. 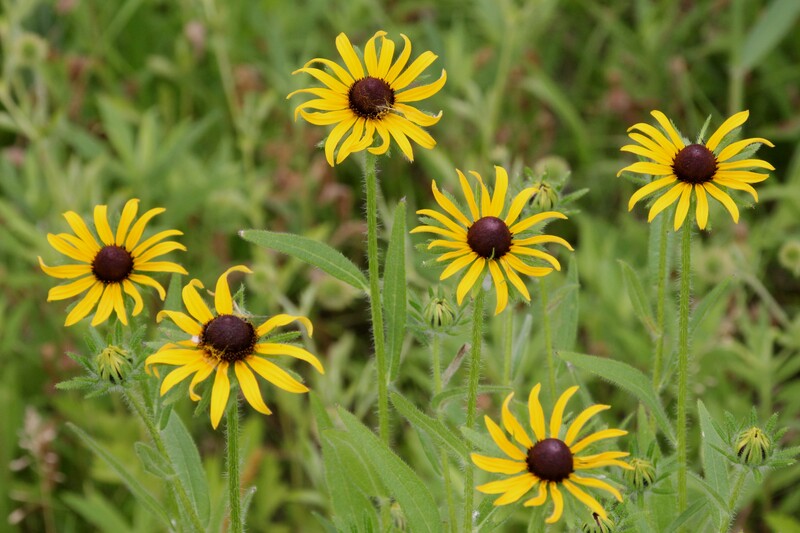 Black-eyed Susans, Griggs Reservoir Park. 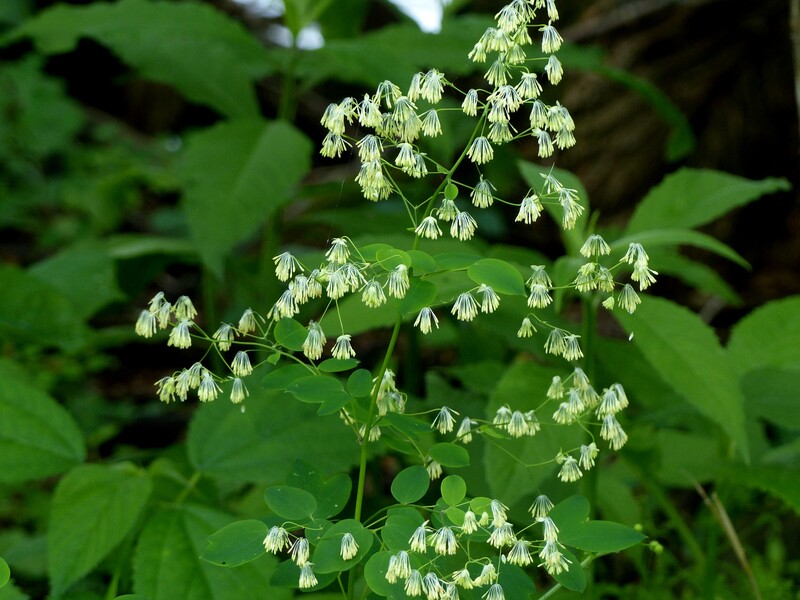 Early Meadow Rue, Griggs Reservoir Park, (Donna). 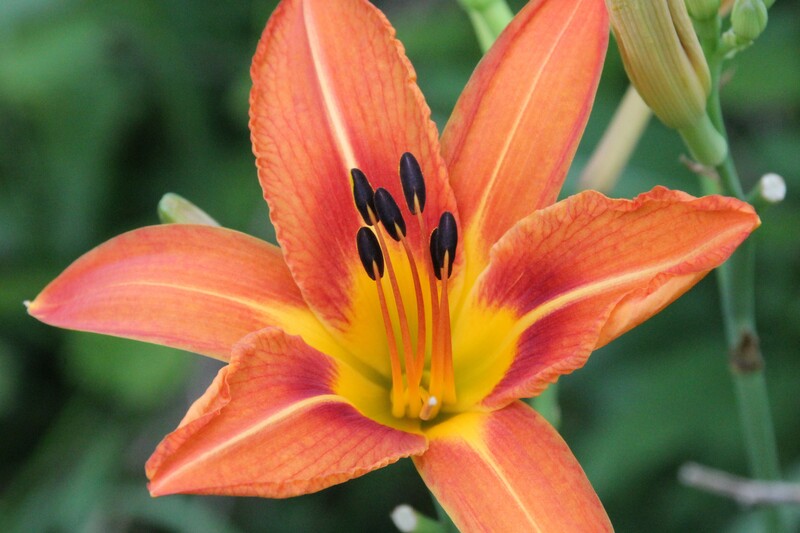 Day Lily, Griggs Reservoir Park. 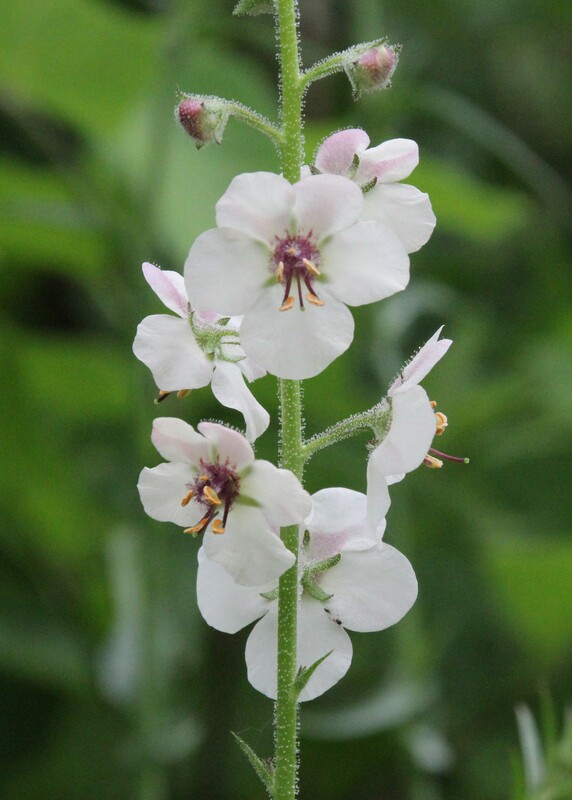 Moth Mullein, Griggs Reservoir Park. 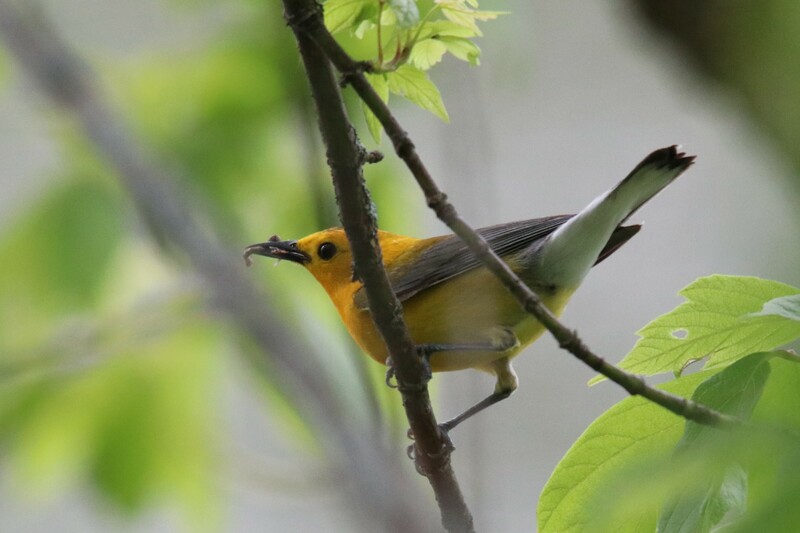 While we were excited to see Prothonotary Warblers nesting so close to home there was no storage of other birds to fascinate. 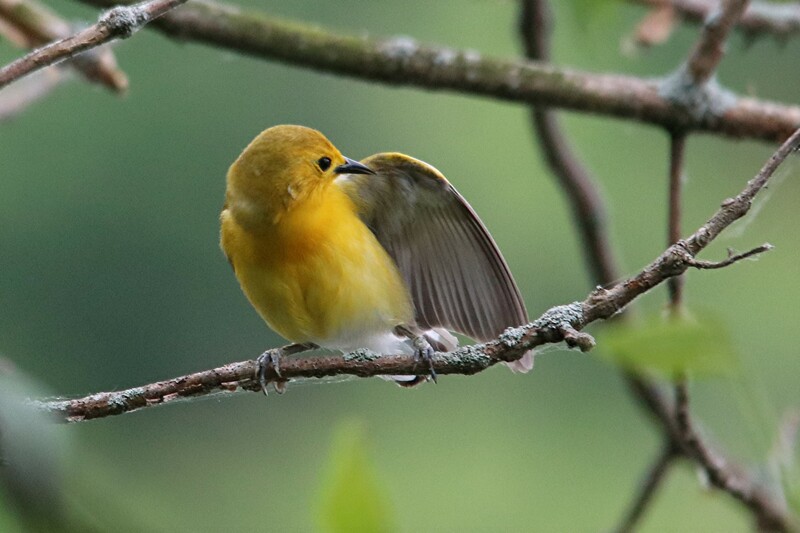 We’d been seeing this nesting Prothonotary Warbler for a few weeks in Griggs Reservoir Park. We finally were able to get some pictures. 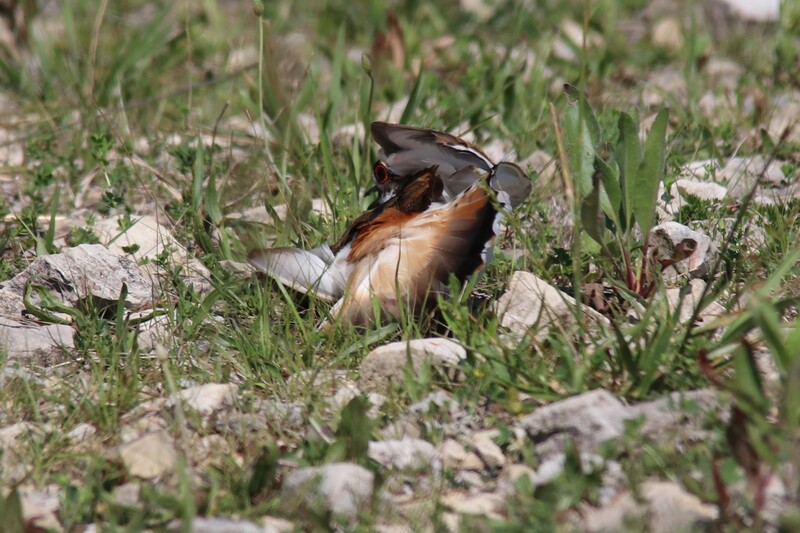 It must be nesting nearby because at one point it was observed taking food to it’s young. 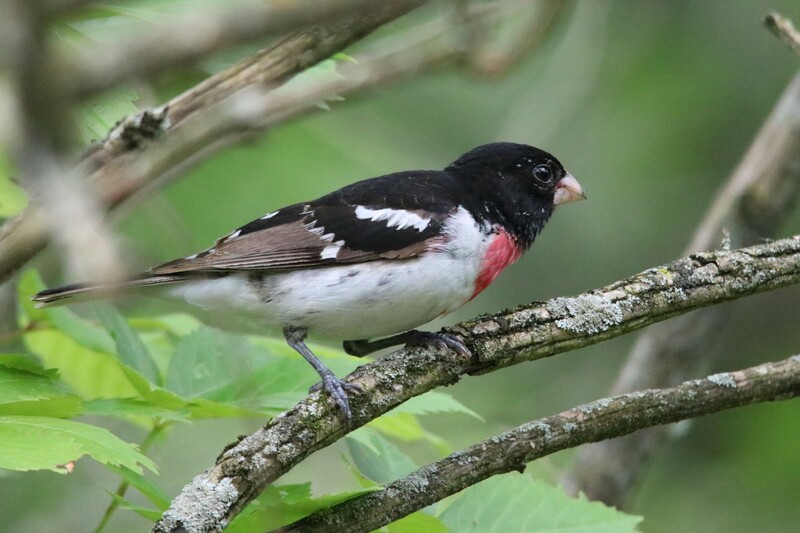 The Rose-breasted Grosbeak is not common this time of year in Griggs reservoir Park. 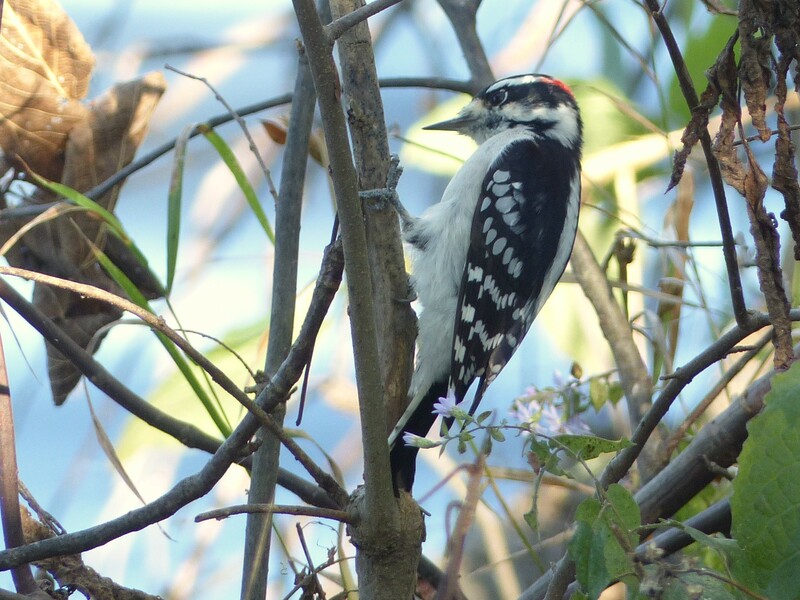 A Downy Woodpecker making effective use of it’s tail, Griggs Reservoir Park. 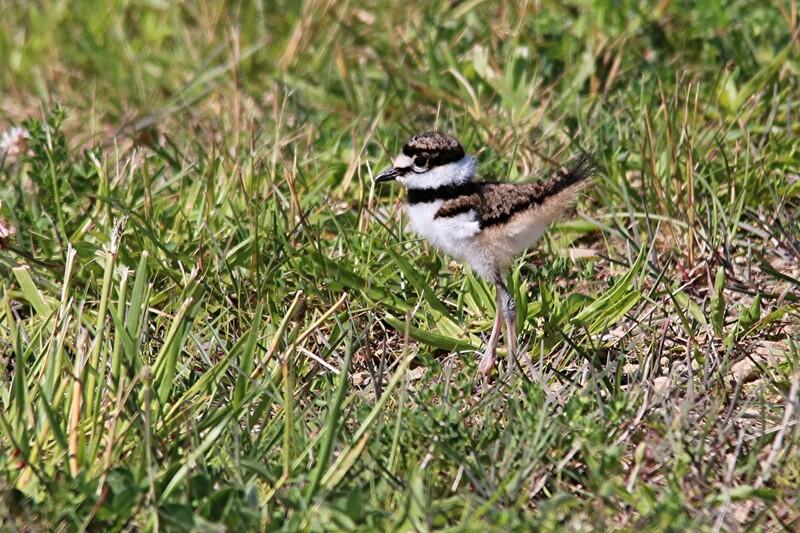 An adult Killdeer tries to get our attention, Prairie Oaks Metro Park. It tries a little harder, something must be going on. 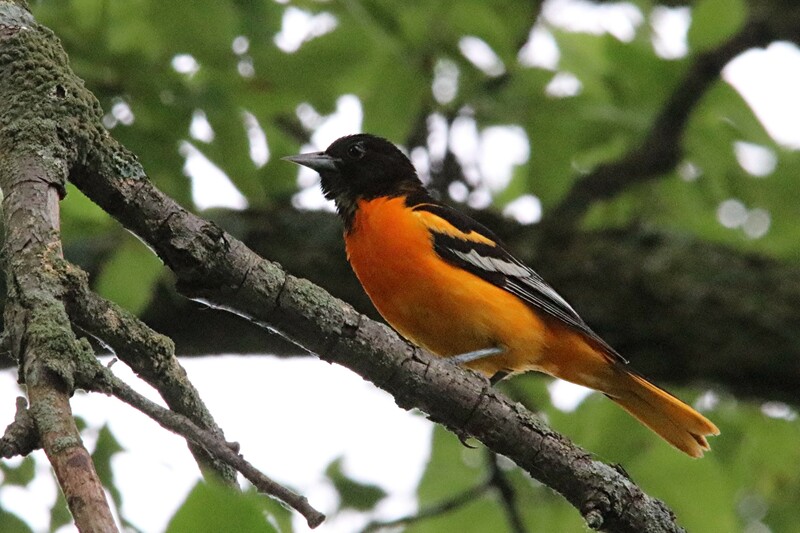 A male Baltimore Oriole makes it’s presence known in Griggs Reservoir Park. 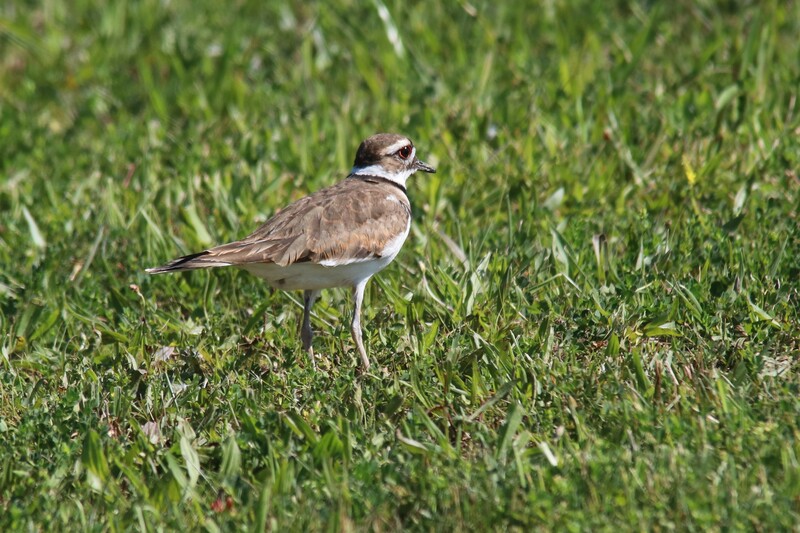 It’s been a great year for these birds in the park. 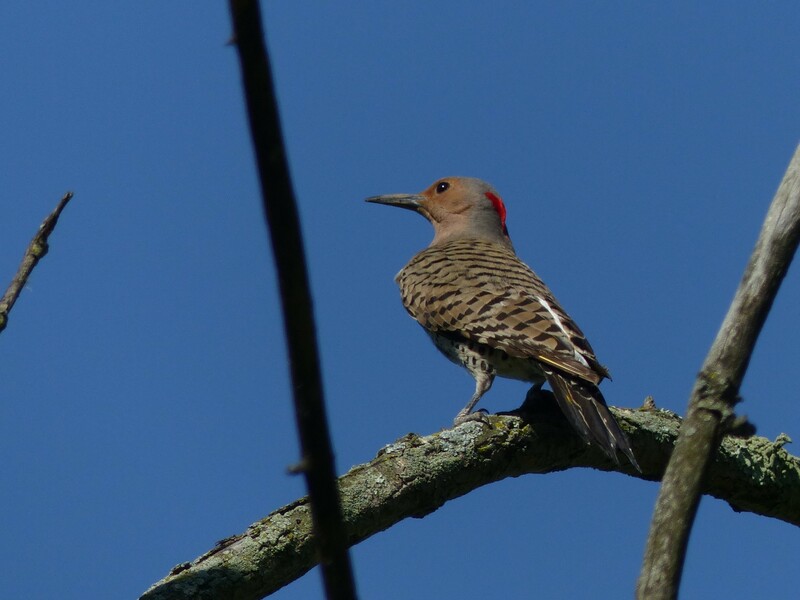 This Northern Flicker, often seen in a fairly localized area, must have a nest nearby, Griggs Reservoir Park. 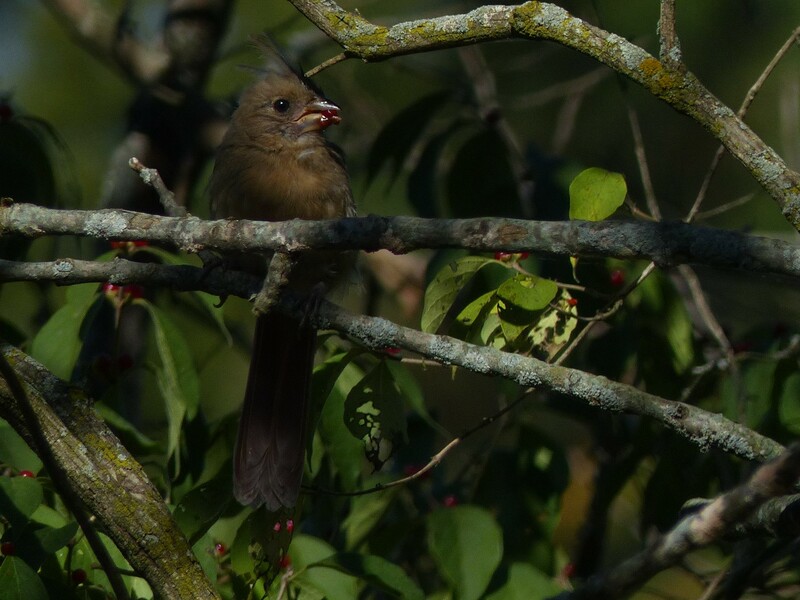 Numerous Catbirds continue to entertain in Griggs Reservoir Park. A Mallard keeps an eye on us as we walk along the water in Griggs Reservoir Park. 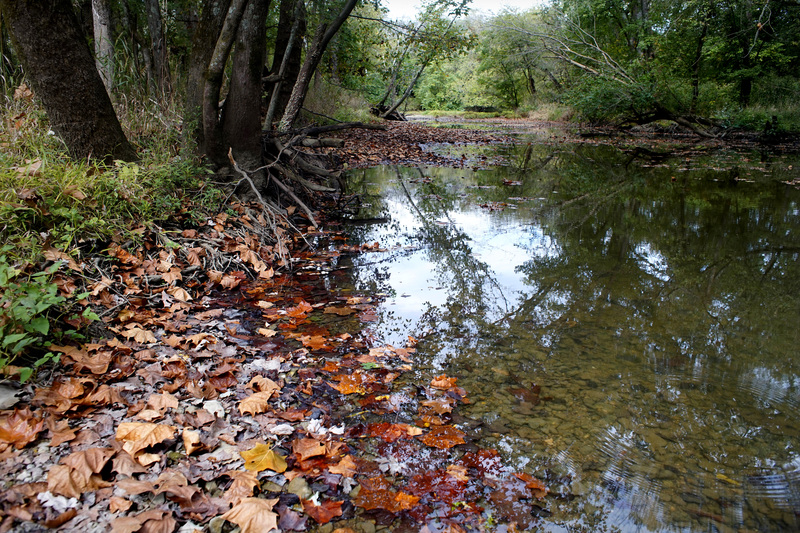 A stream benefits from recent rain in Prairie Oaks Metro Park. 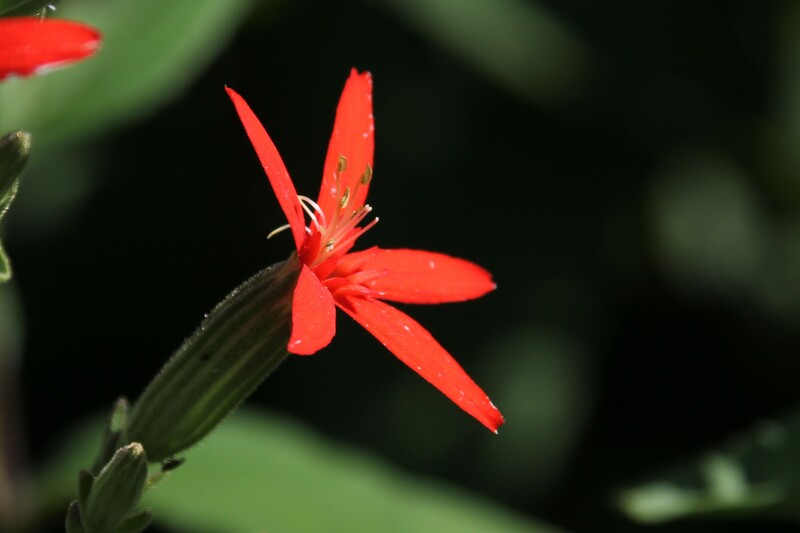 Nature unfolds and reveals itself like a flower, first reluctantly and then with grace. May you be rewarded with new wonder, seeing and appreciating more each time. The last several days have been beautiful. Clear skies, cool nights and comfortable days with very little wind. Certainly something to remember, especially three months from now. When the weather is this nice you certainly want to put it to good use. 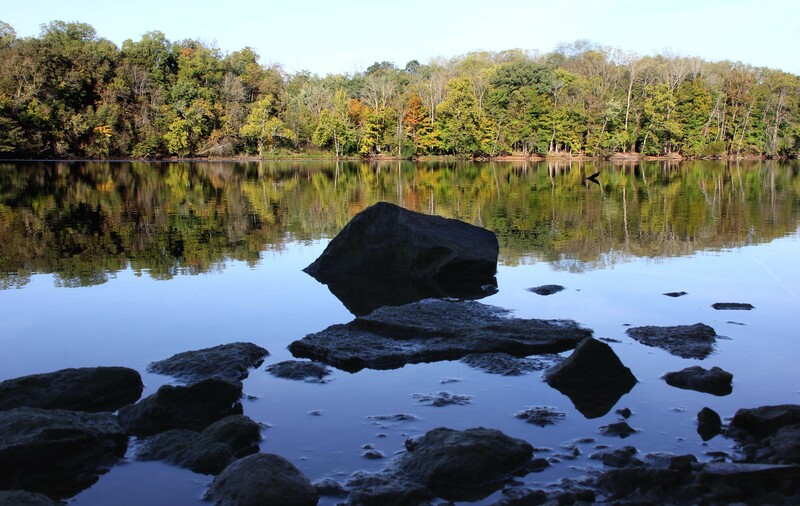 With that in mind we’ve enjoyed paddling with friends on Griggs Reservoir and have also spent some time in Griggs Park as well as Prairie Oaks and Battelle Darby Creek Metro Park looking for migrating birds. 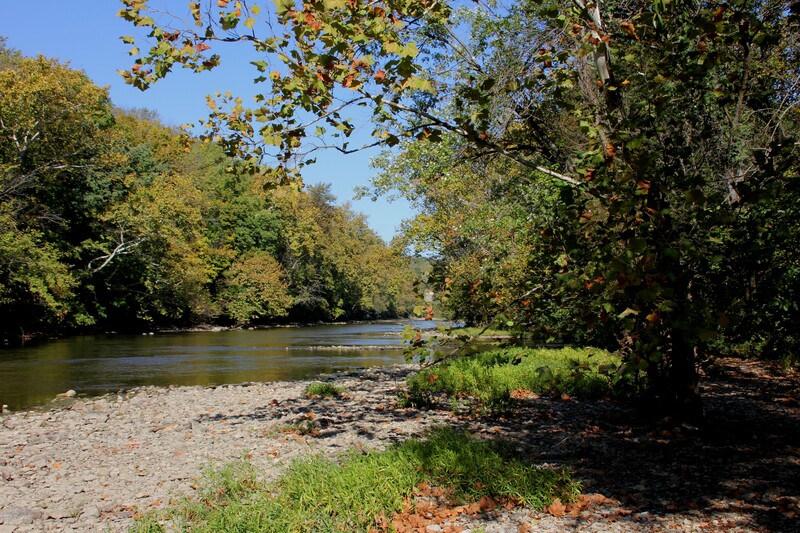 We haven’t seen as many warblers as we were expecting but other birds and the hint of fall colors have made up for it. 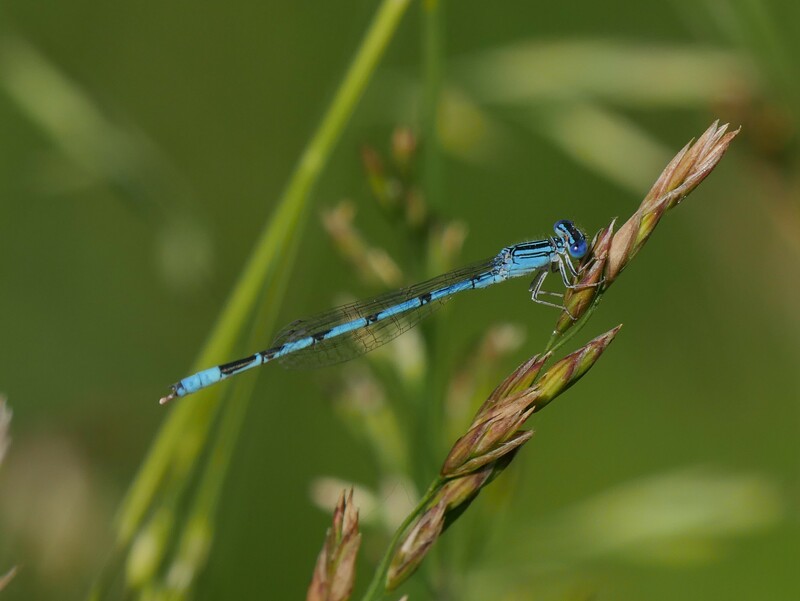 When you’re paddling the shoreline of a lake or walking in the woods on a trail that for a time may follow a quiet a stream, there’s always the possibility that you’ll see something totally unexpected and more beautiful than you could ever imagine. 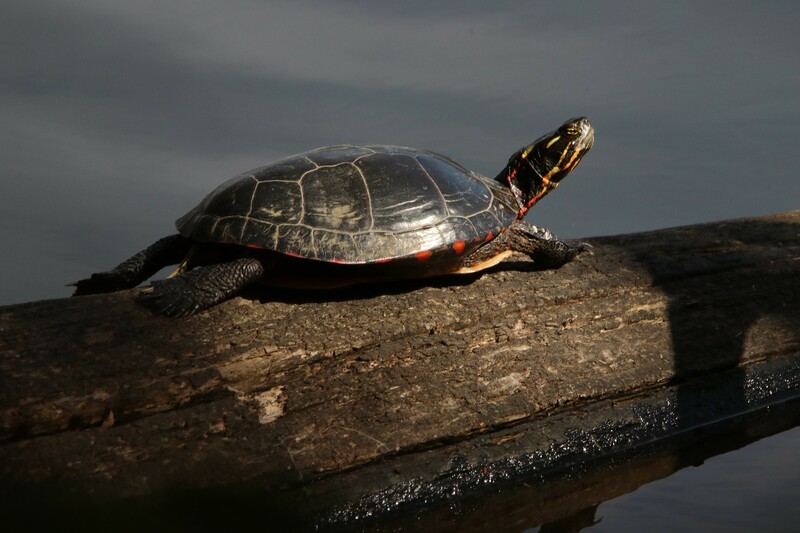 A Painted Turtle enjoys the autumn sun, Prairie Oaks Metro Park. Coopers Hawk, Battelle Darby Creek Metro Park. 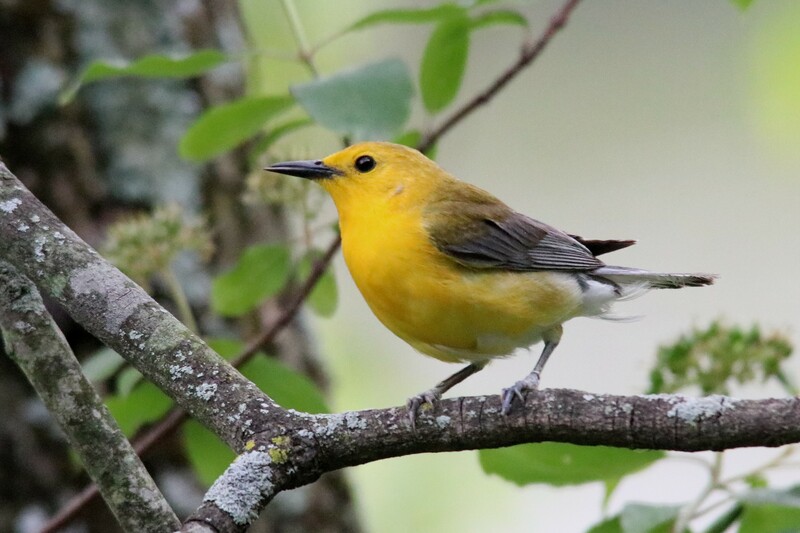 Recently we spent several hours at Prairie Oaks Metro Park looking for migrating warblers and other signs of spring. 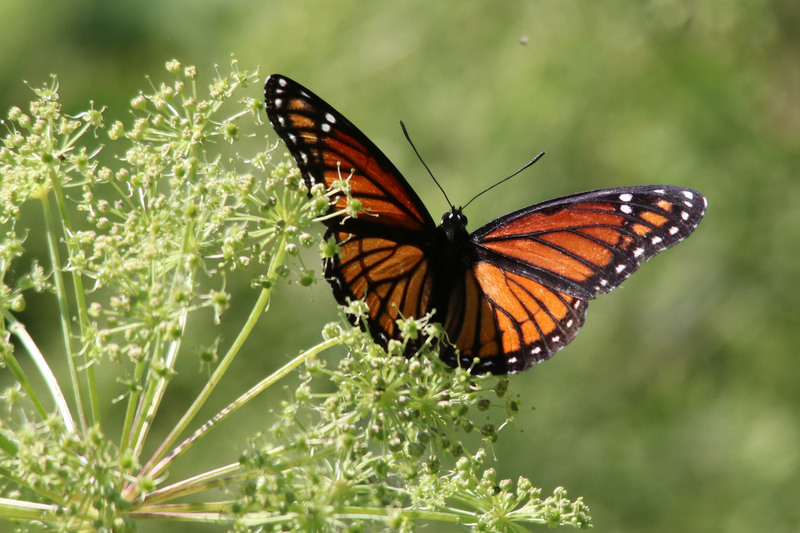 We were completely drawn into the moment with butterflies, wildflowers, warblers and other migrating birds surrounding us as we walked along the river. Sunlight filtering through the emerging translucent leaves creating the effect of green stained glass further setting the mood. 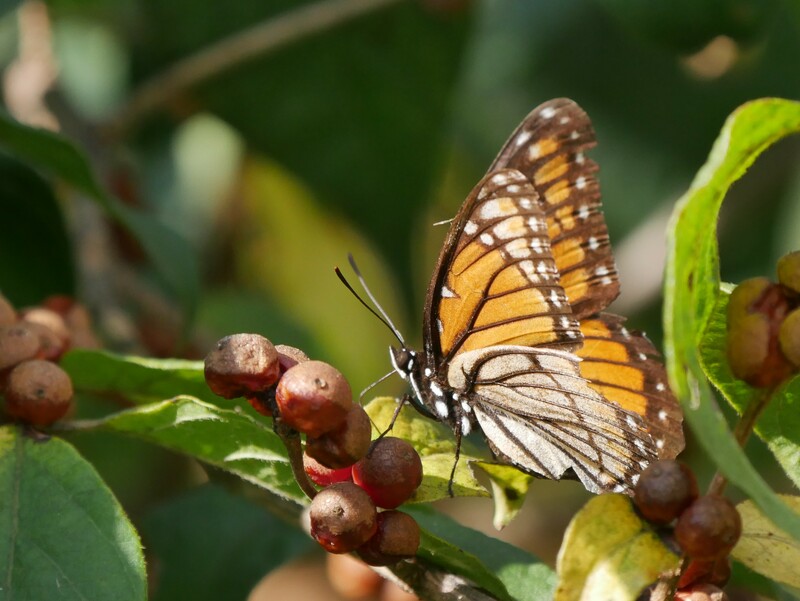 In addition to the pictures below a number of birds and butterflies were seen where no photograph was possible. So below is just a glimpse of what you might have seen had you walked the trails in the last few days. 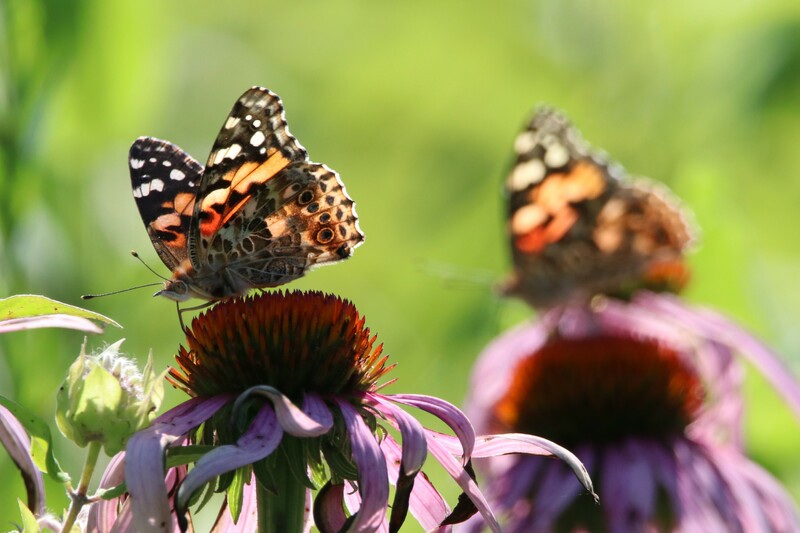 Some pictures turned out amazingly well and others fall into the category of “data acquisition” but they all, in their own small way, celebrate spring at Prairie Oaks. 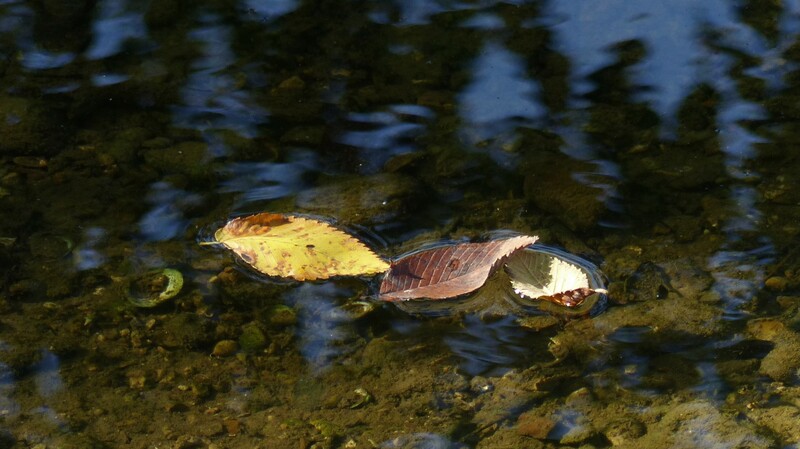 At Prairie Oaks many forms of life are attracted to the river. 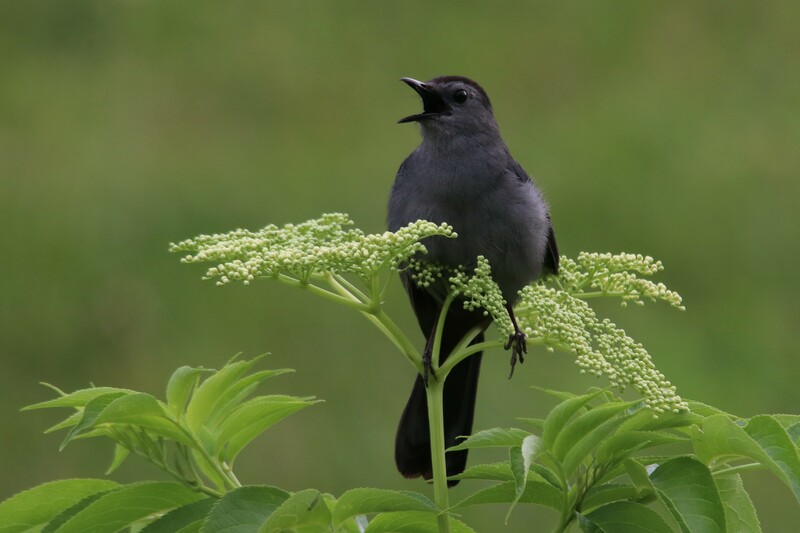 Like warblers, flycatchers and other birds. A Baltimore Oriole watches as we head down the trail. A Great Crested Flycatcher announces it’s presence with a unmistakable call. A Eastern Towhee peeks from behind the leaves. A Kingbird surveys it’s realm from a tree top. Blue-gray Gnatcatchers like to be around water. 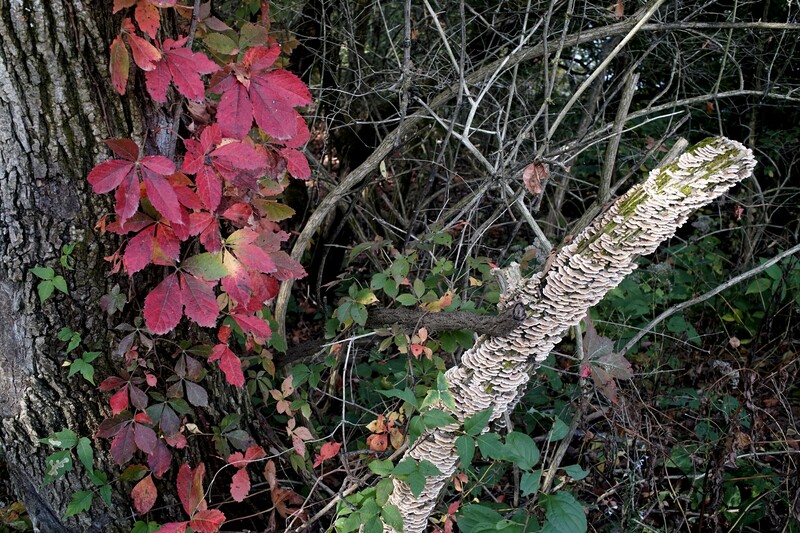 Constantly in motion, a Ruby-crowned Kinglet plays hide and seek. 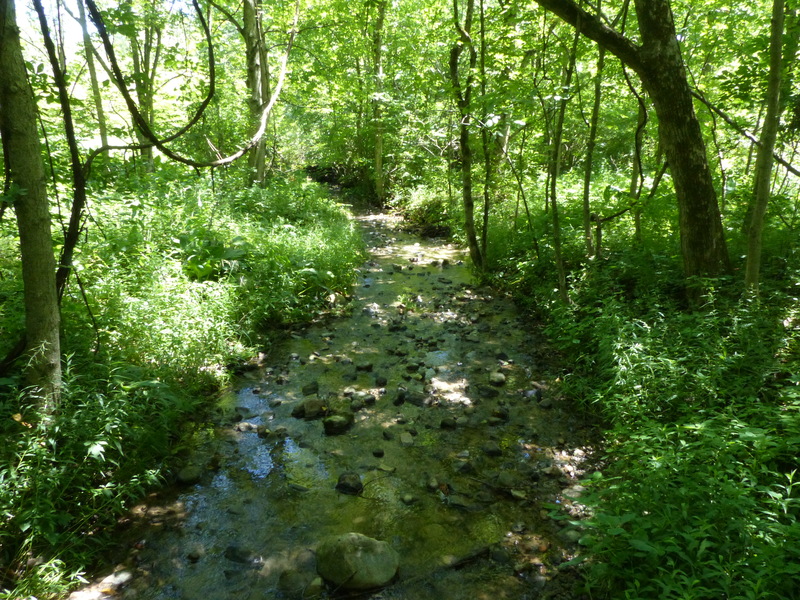 The smaller creeks that feed into the river are often dry by mid summer. Butterflies were enjoying the spring sun. A pond that may also be dried up by July. But right now the pond is home. 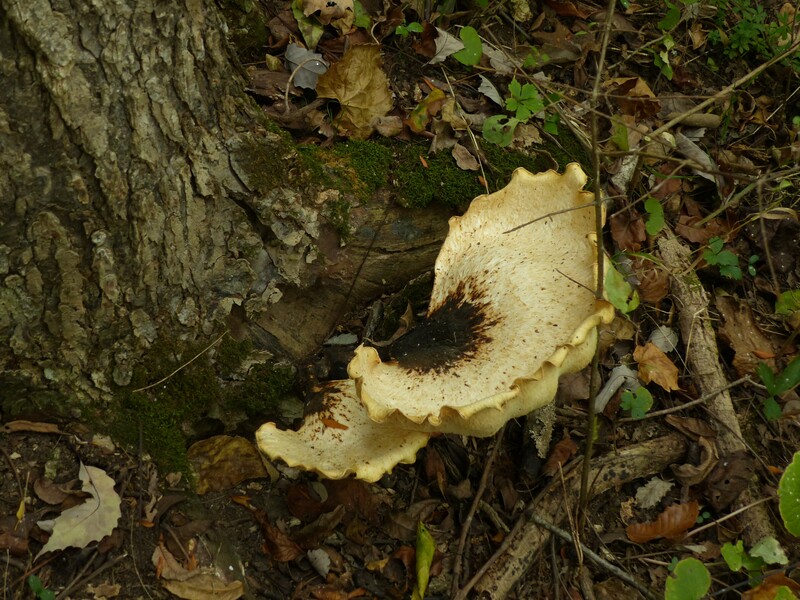 Fungi run a very close second to wildflowers in natures beauty contest. 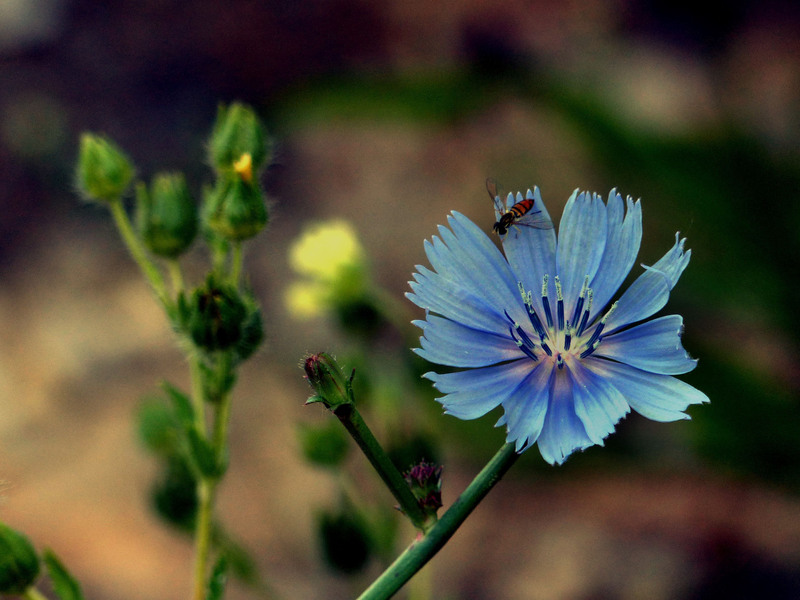 Wildflowers compete for our attention. The Big Darby was flowing clear. 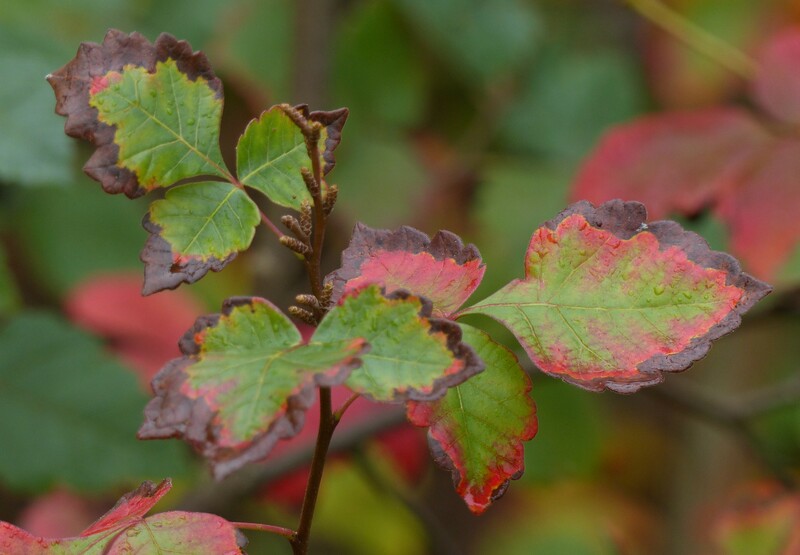 Translucent leaves contribute to the magic of spring.